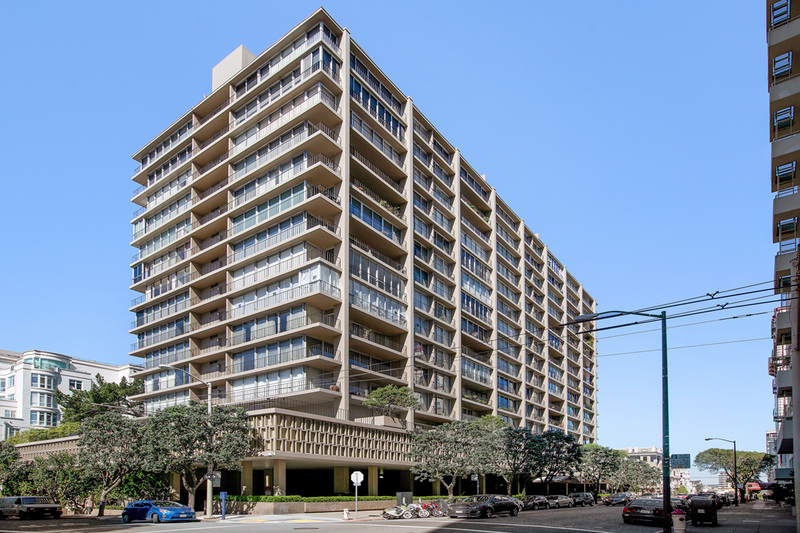 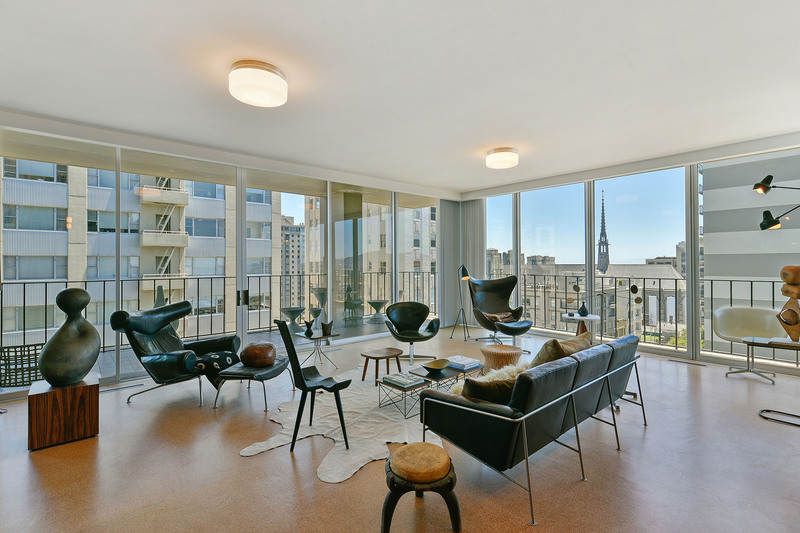 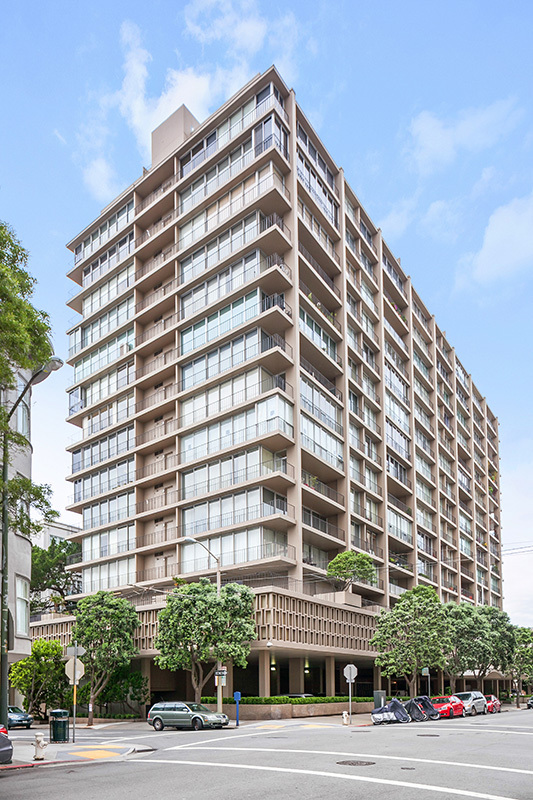 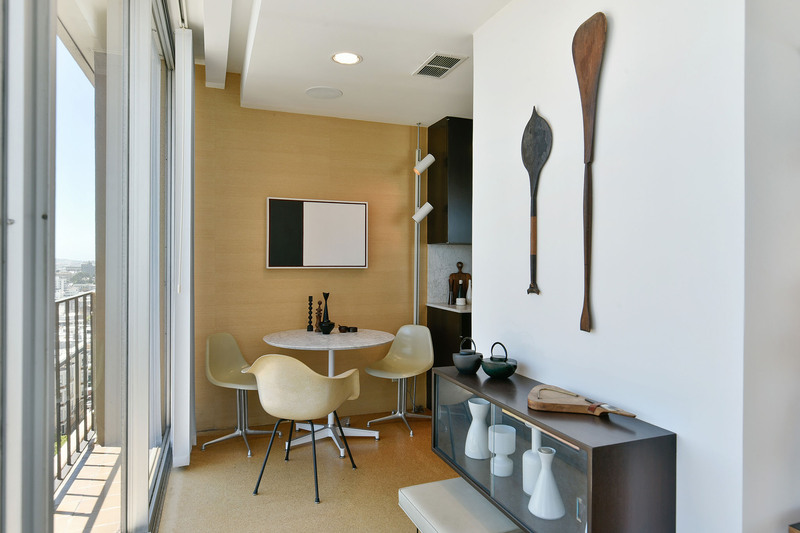 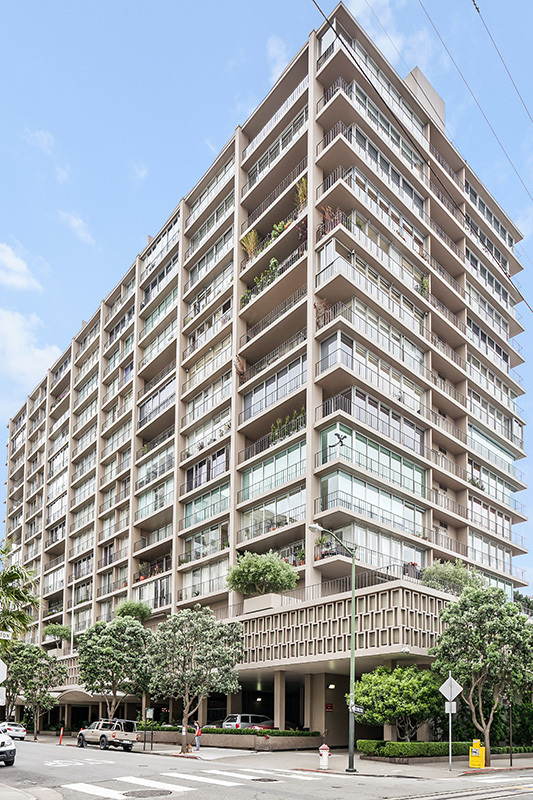 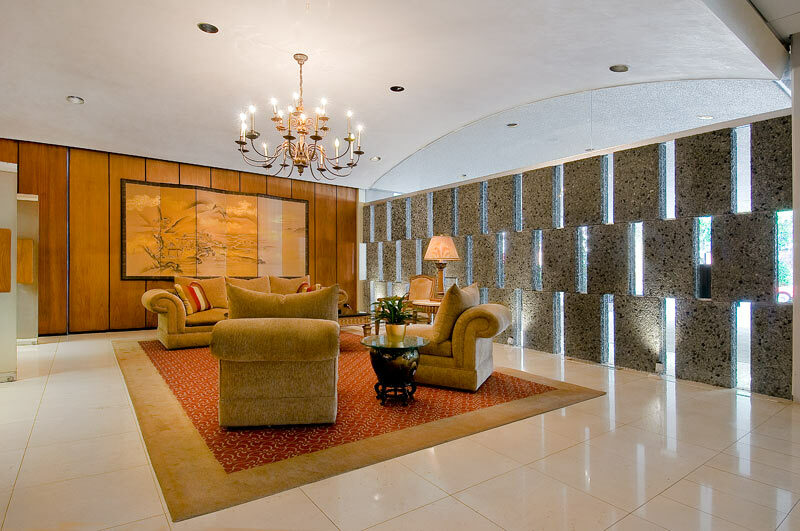 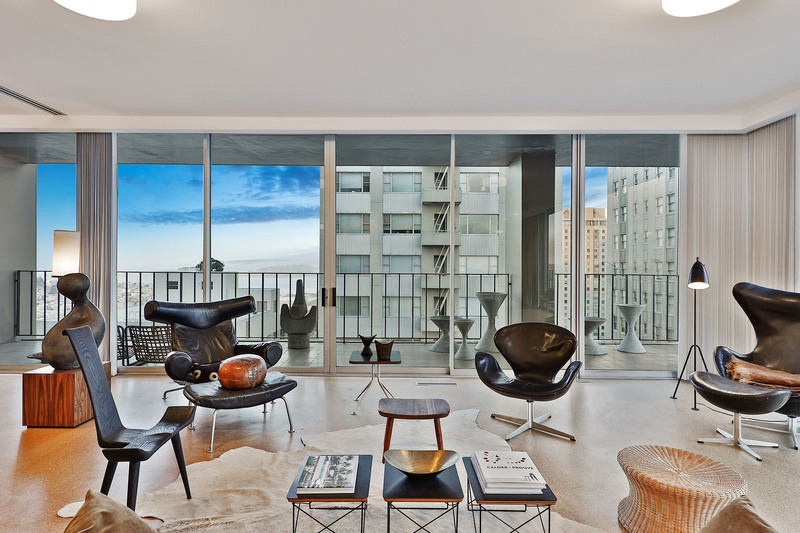 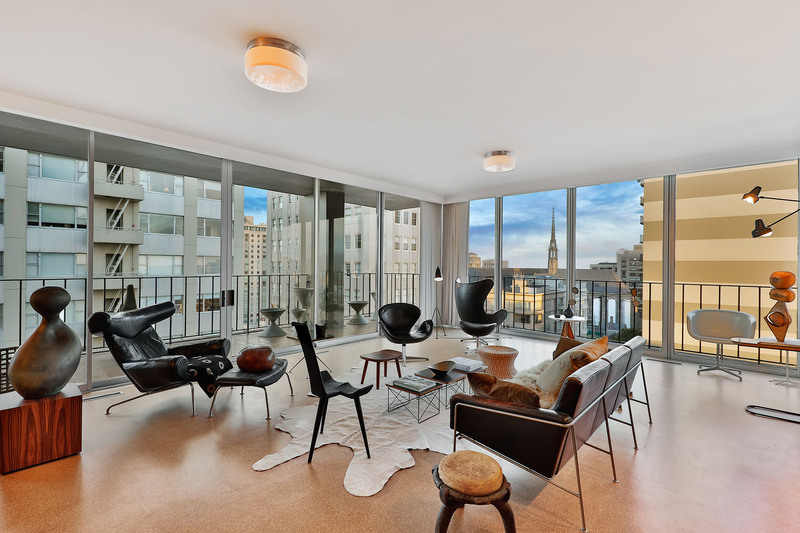 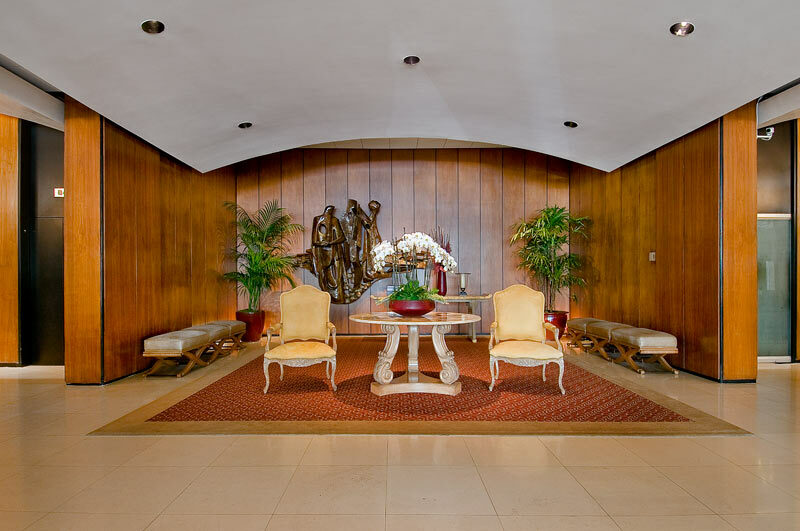 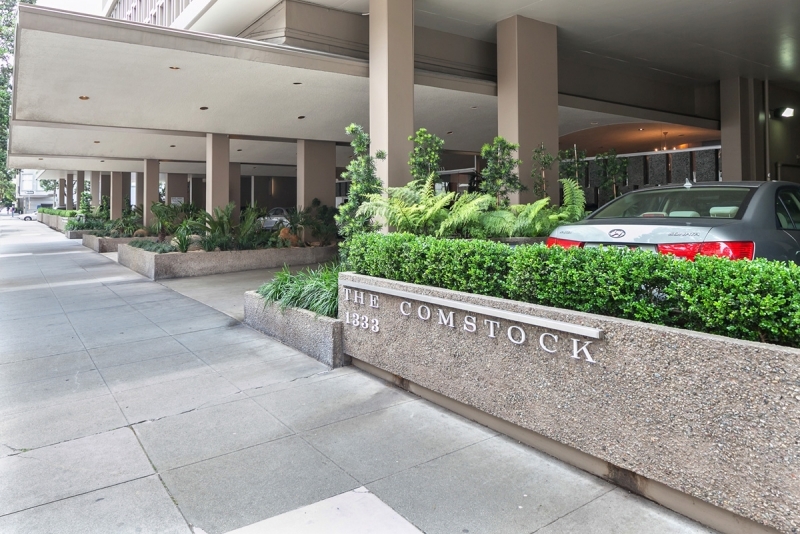 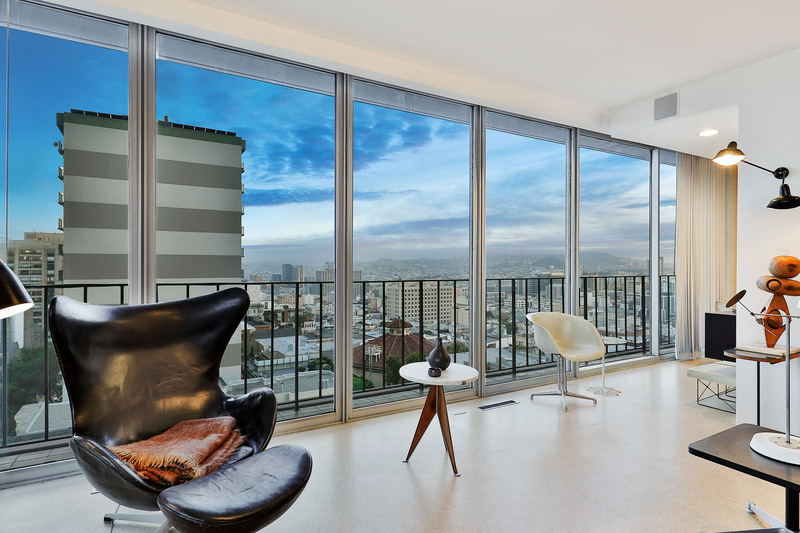 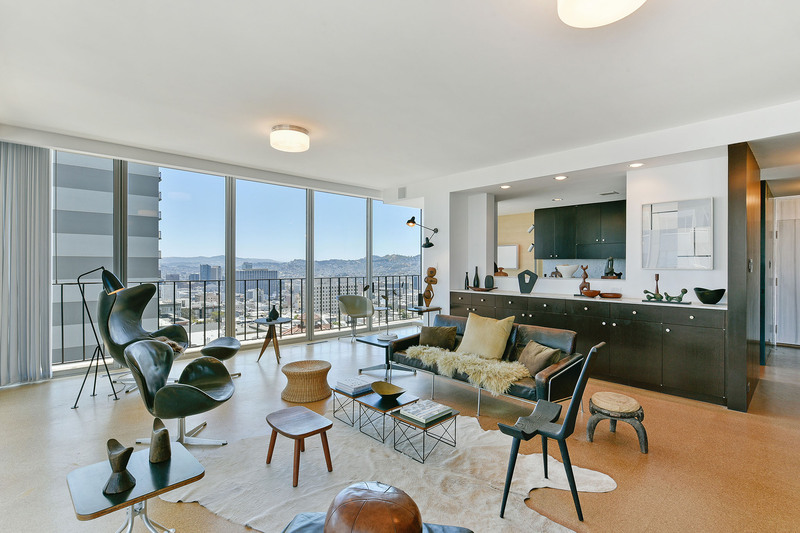 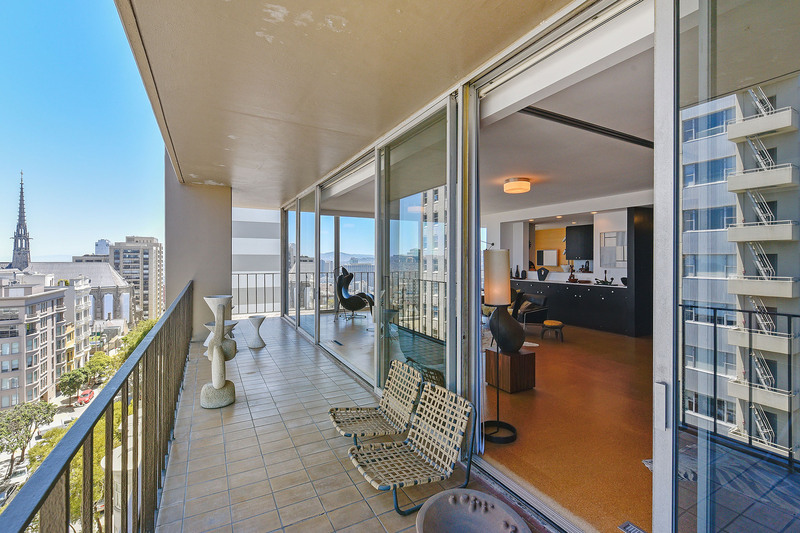 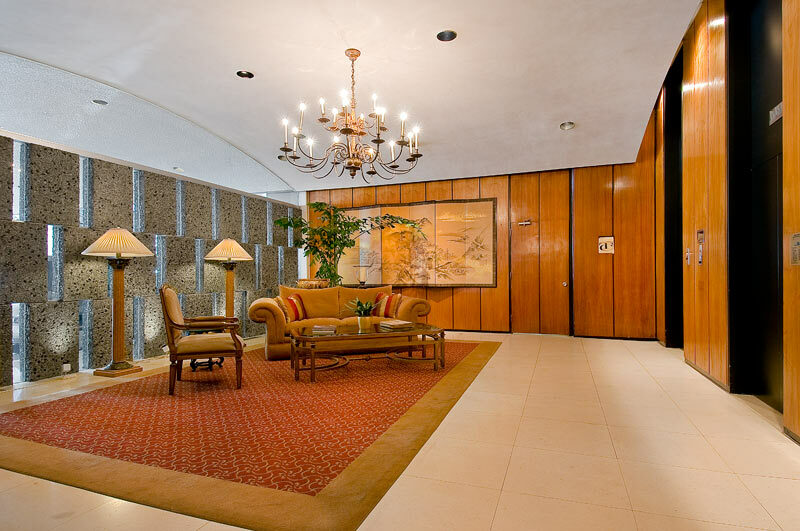 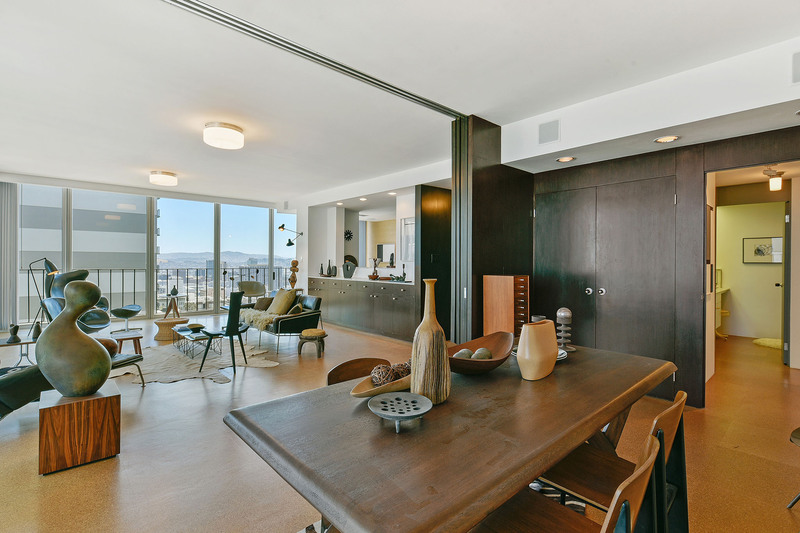 This large southeast corner condominium in the Comstock Building, one of San Francisco’s best midcentury high rises, is an example of modernist design at its finest. 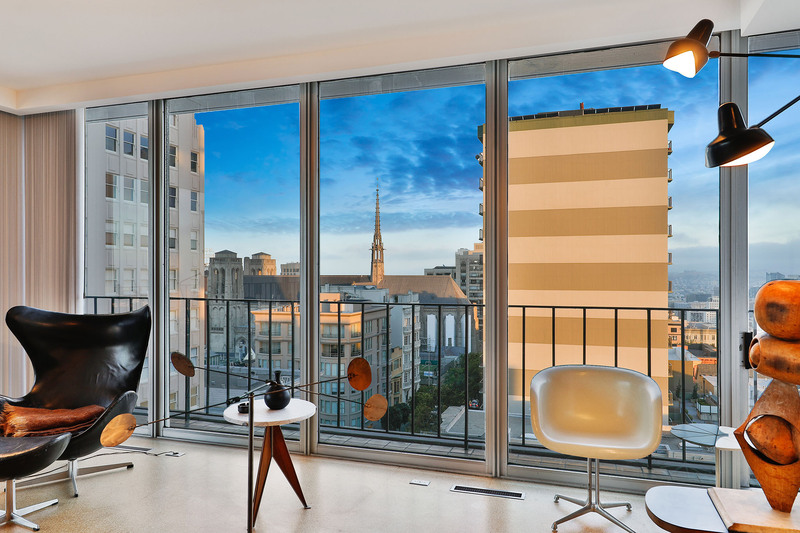 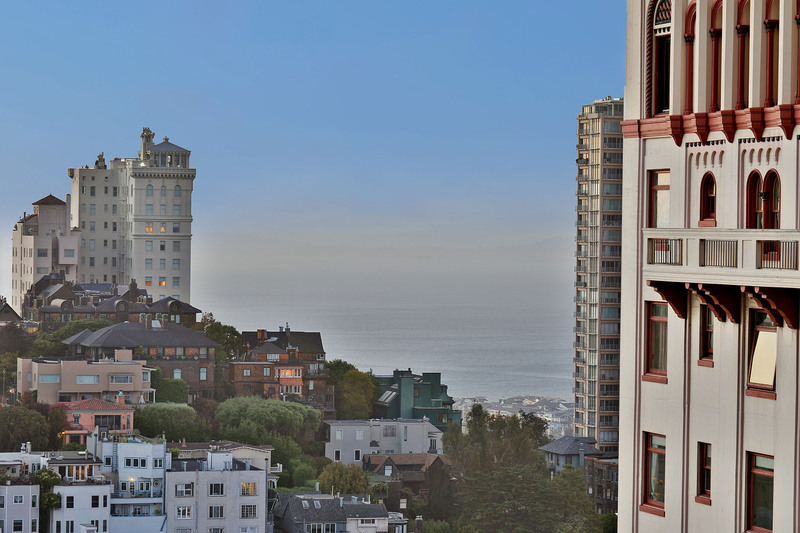 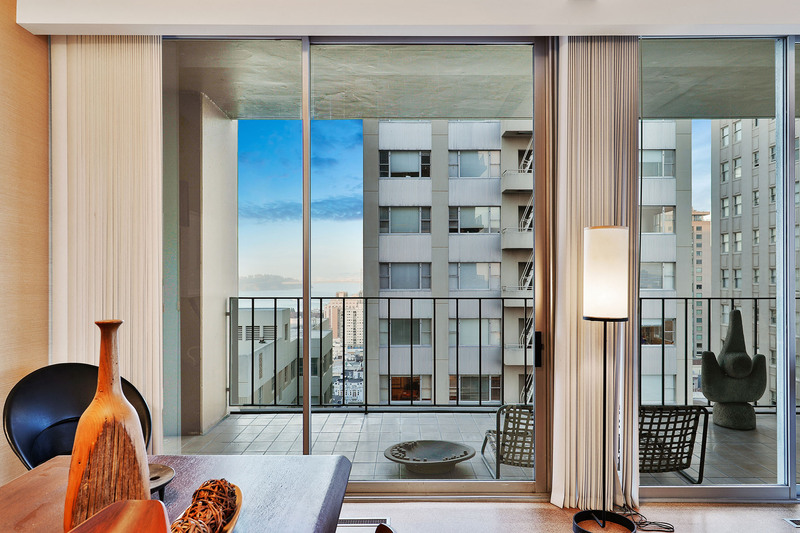 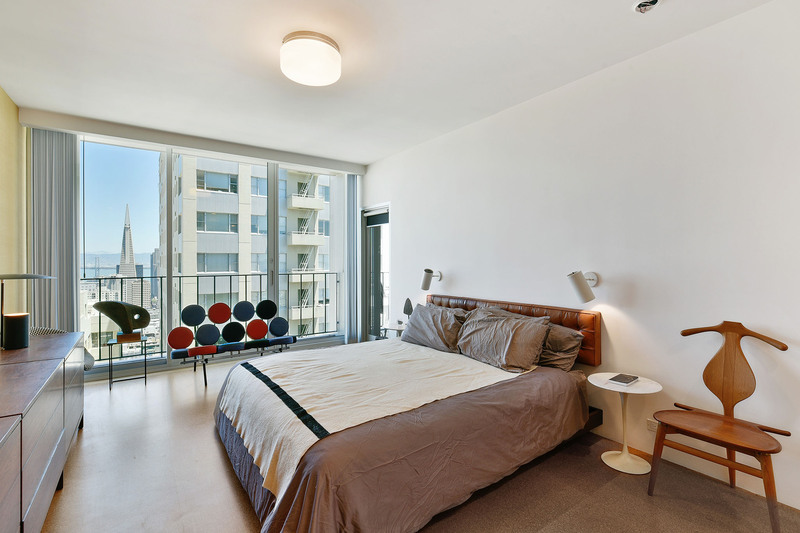 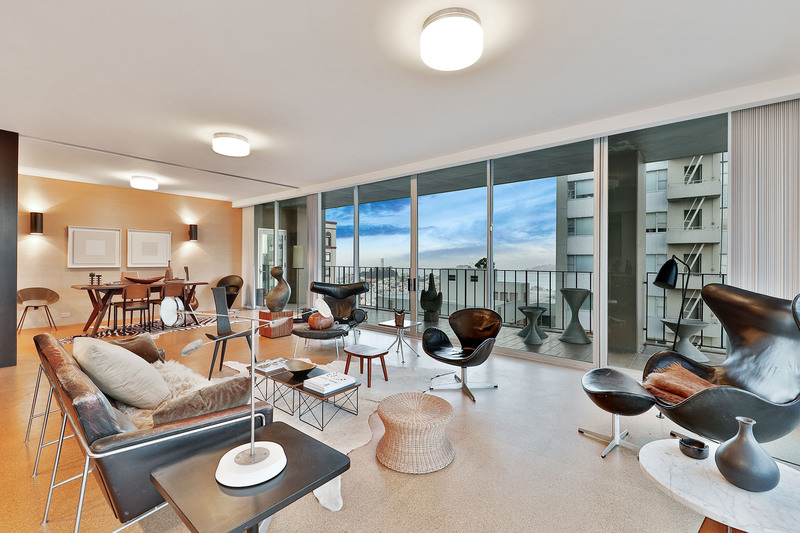 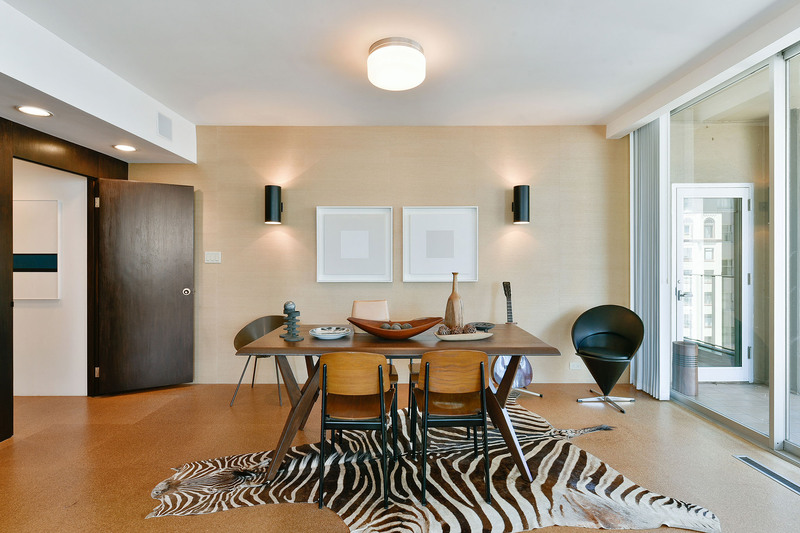 With interiors by renowned purists of modern architecture and glass walls that showcase the City from atop Nob Hill, this is San Francisco moderne. 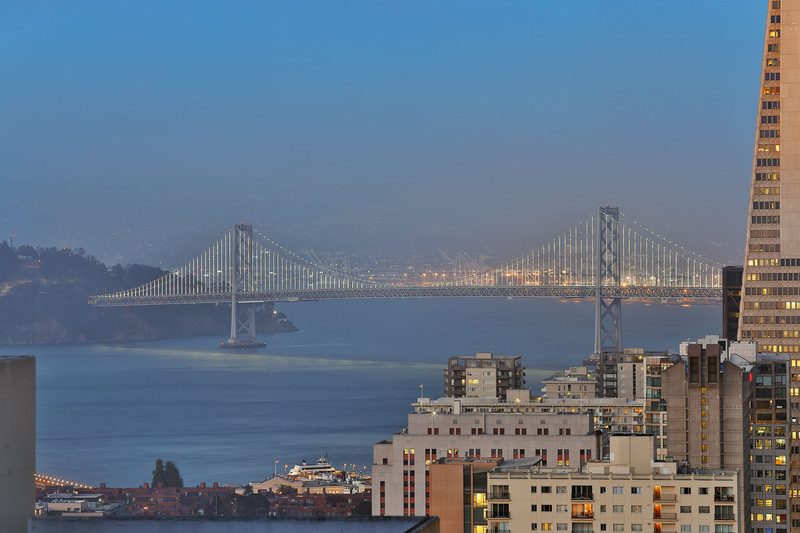 From the living room, kitchen and bedrooms, one can see the San Francisco Bay, Coit Tower, Treasure Island, the Bay Bridge, Grace Cathedral, Sutro Tower and the City lights. 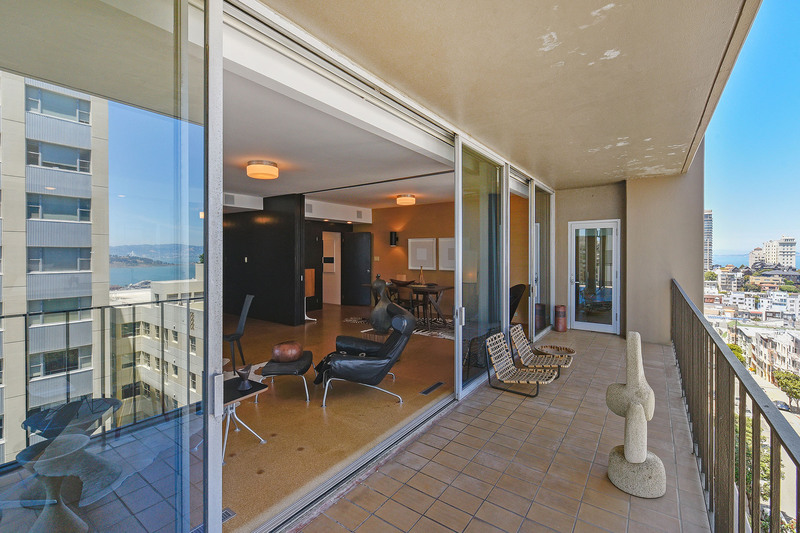 Sliding glass doors lead to a 39-foot terrace that spans nearly the length of the unit and offers plenty of space for outdoor entertaining. 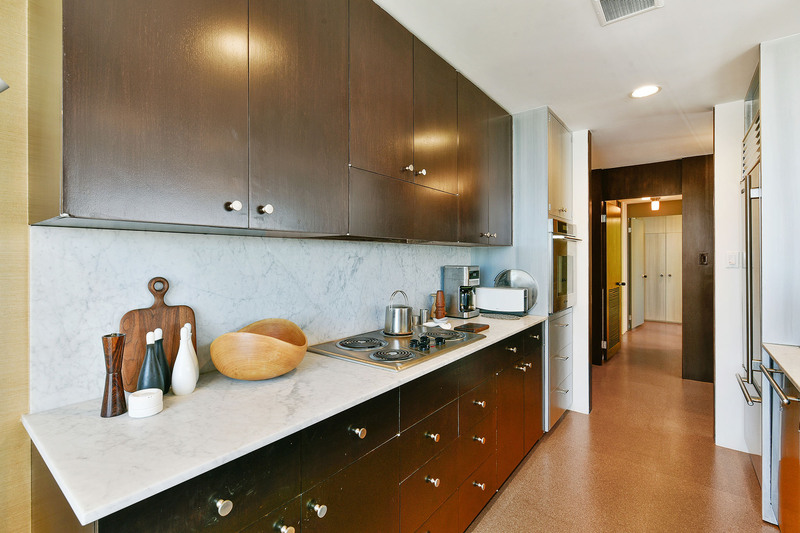 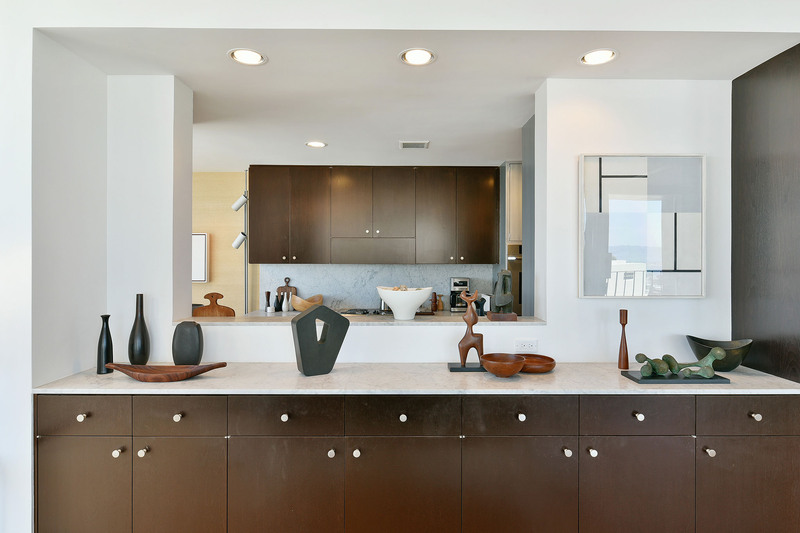 The bright and open kitchen features contrasting mahogany-stained and aluminum-painted cabinetry with Carrara marble countertops. 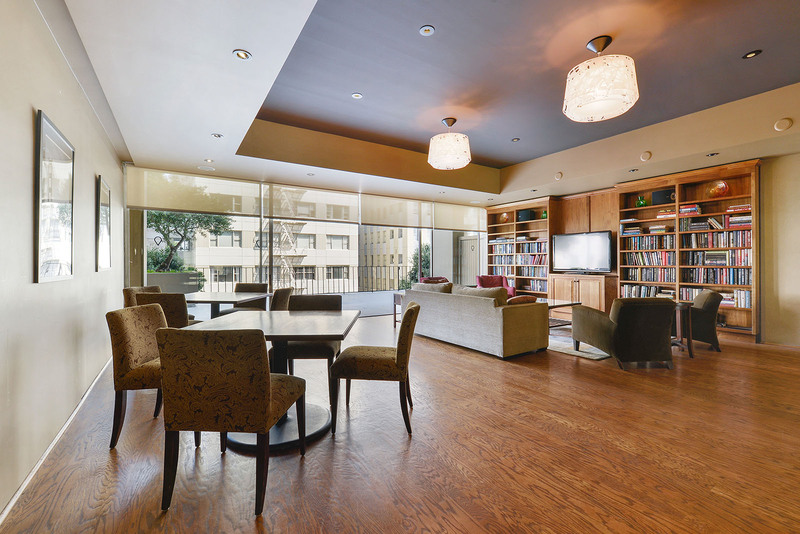 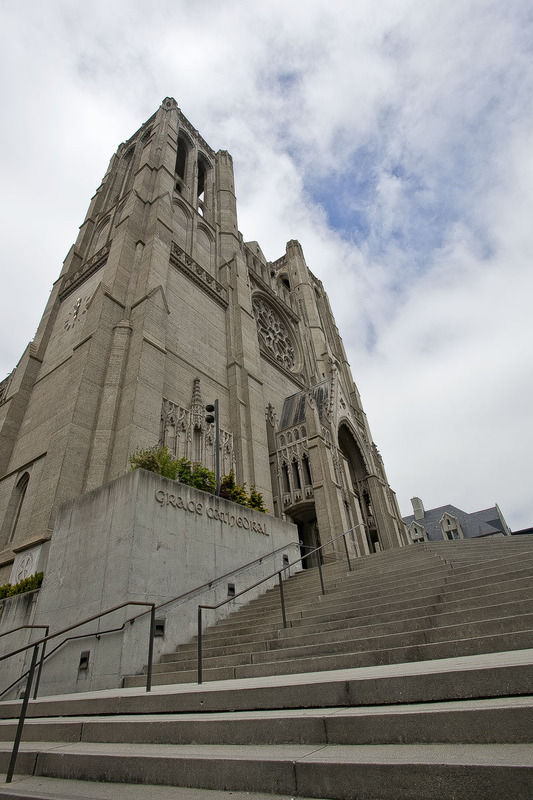 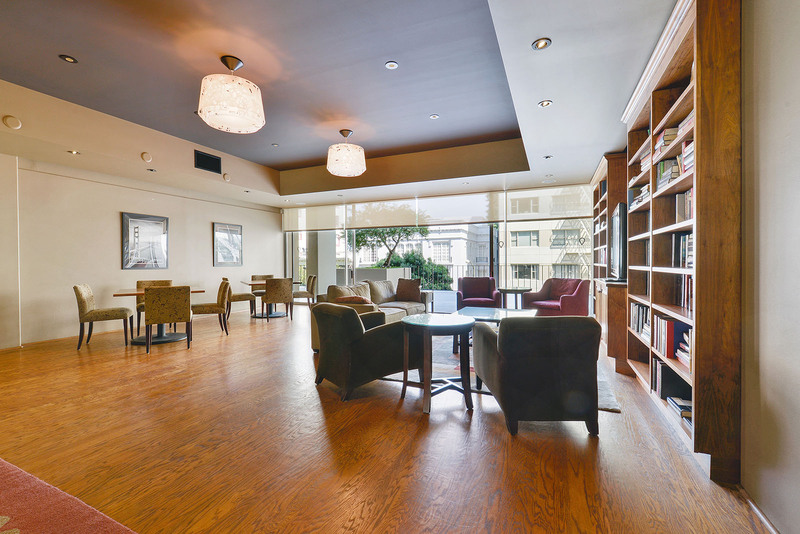 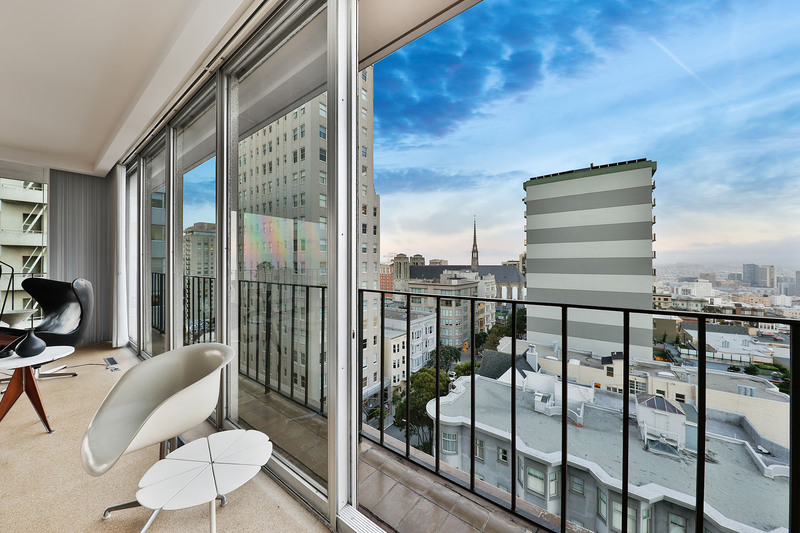 Grasscloth wallpaper, finished cork floors, and dramatic views of the City and Grace Cathedral accent the eat-in area. 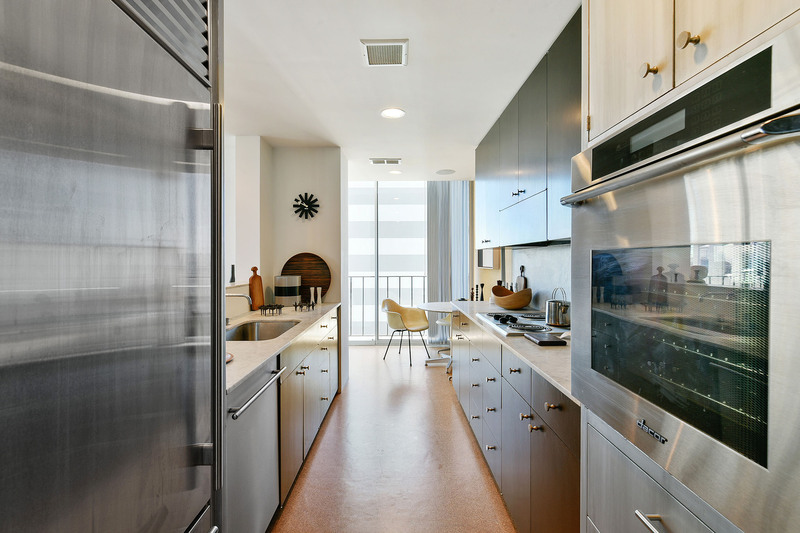 Stainless appliances include a SubZero refrigerator, Asko dishwasher, Dacor oven and GE range with hood. 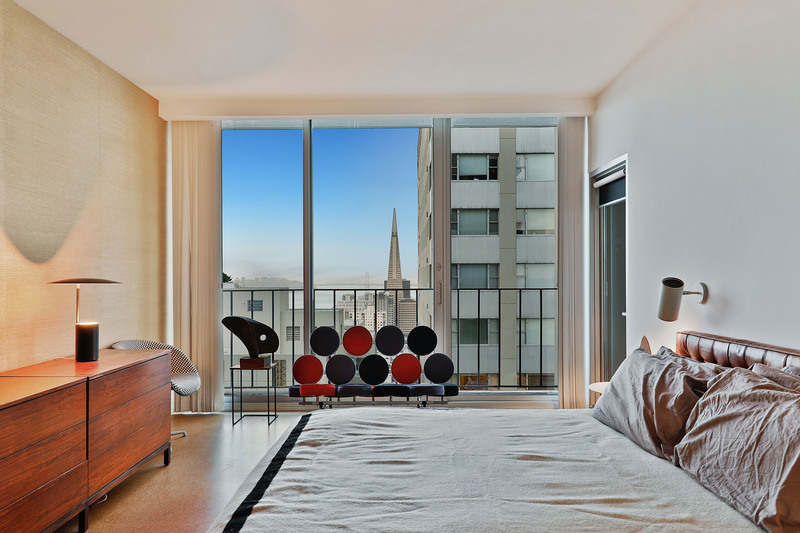 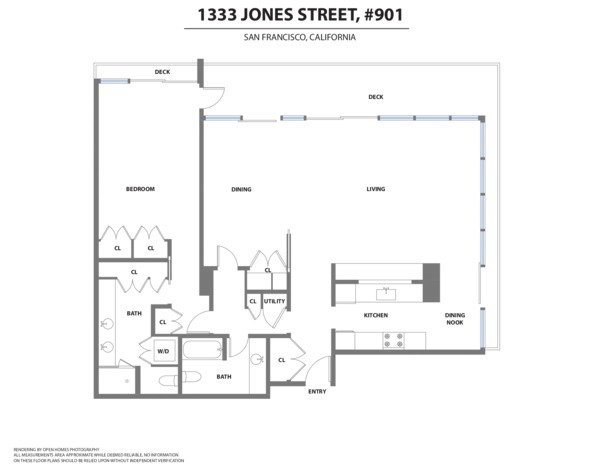 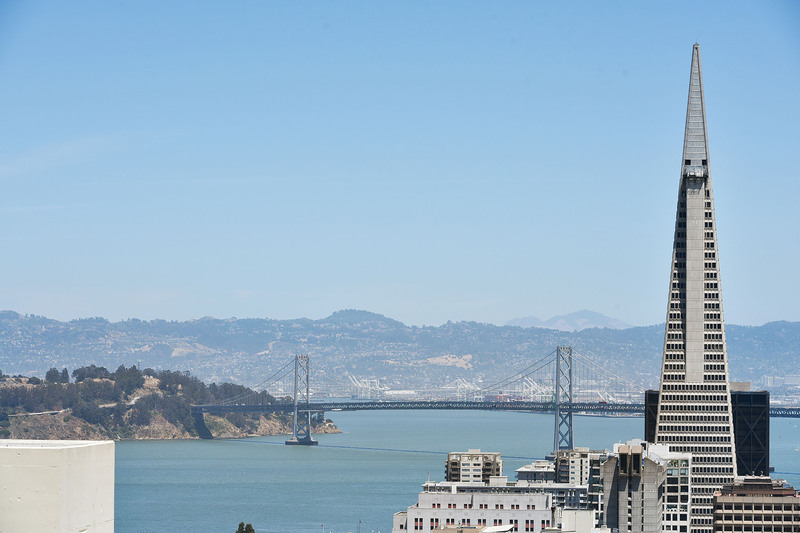 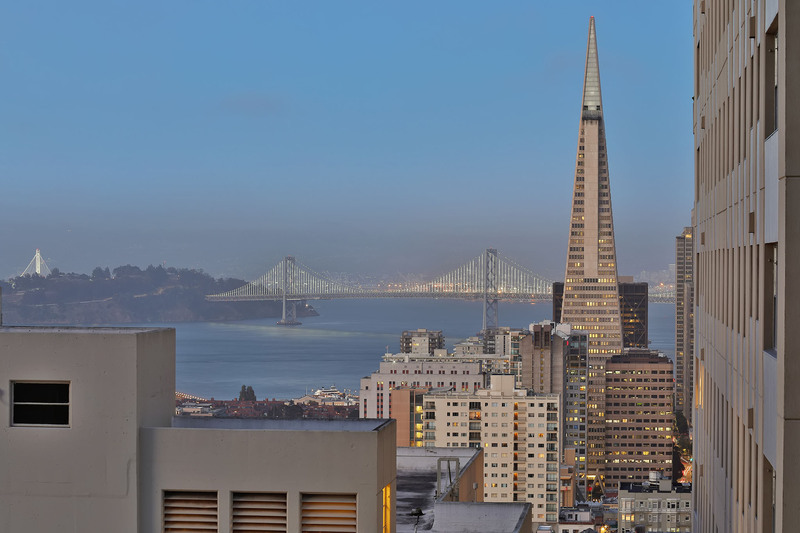 With stunning views of the Transamerica Pyramid, the Bay Bridge, and the East Bay Hills, the spacious master suite opens to the terrace. 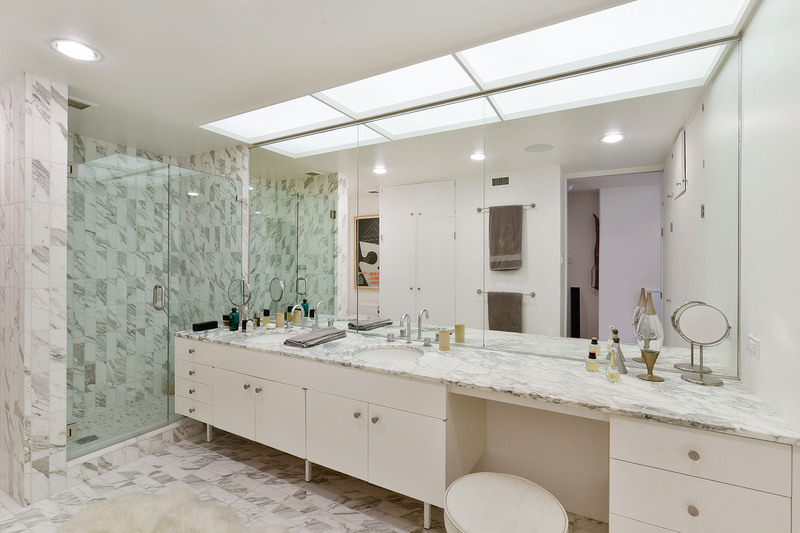 The large master bath features the original 1965 white Carrara marble double sink vanity, beautifully preserved and combined with modern white Carrara tiles on the floor and in the shower. 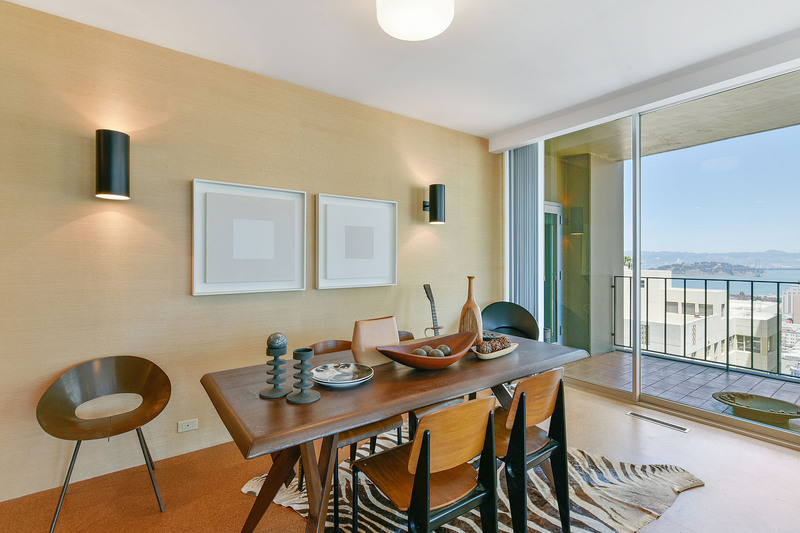 The second bedroom, currently used as a dining area, boasts glass walls with similar views to those in the master suite, as well as access to the terrace. 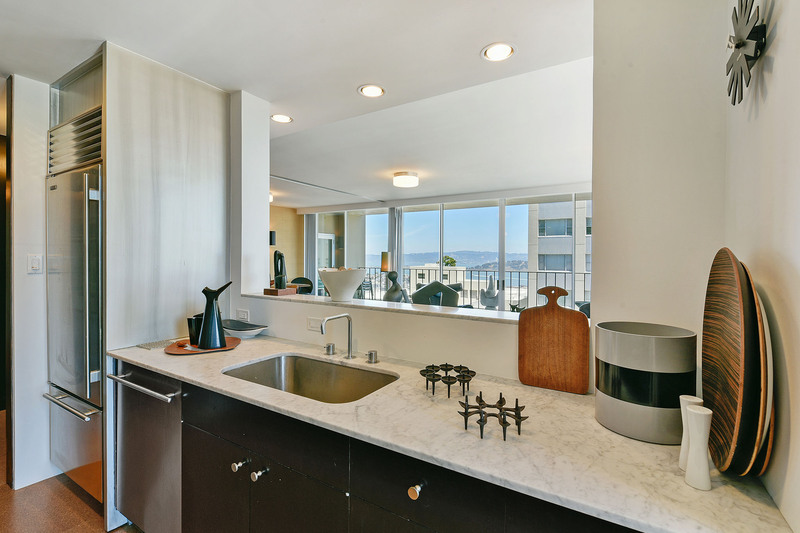 The bathroom includes a tub and white Carrara marble vanity. 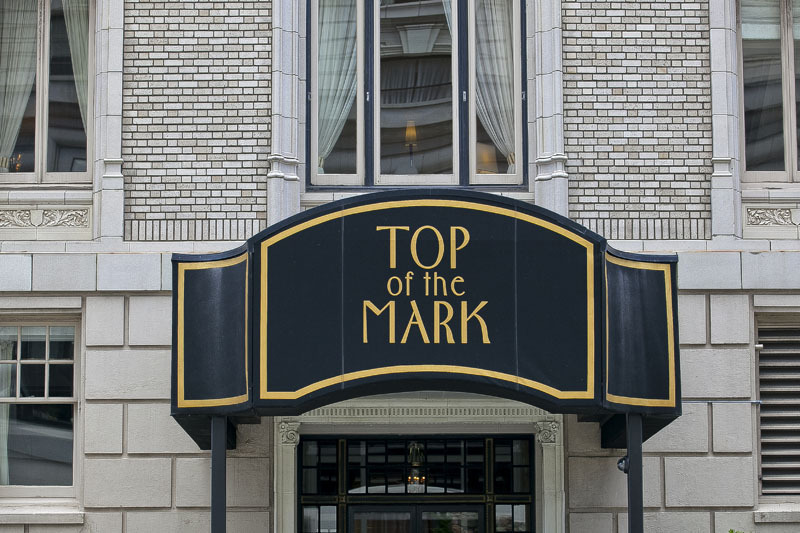 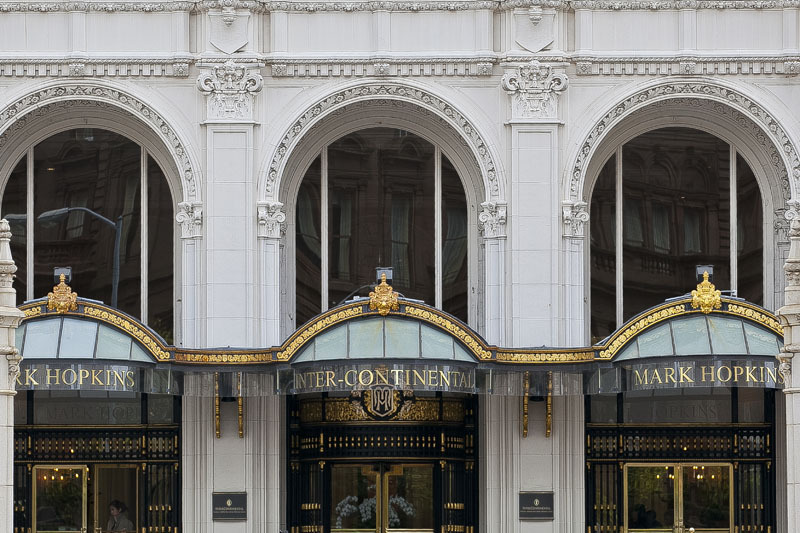 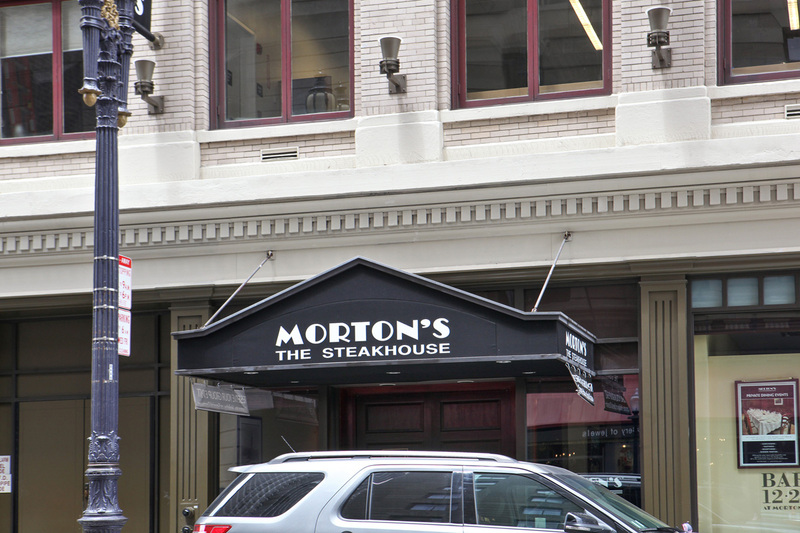 The Comstock is a full-service 24-hour doorman building with a club room and a walking terrace around the building on the third floor. 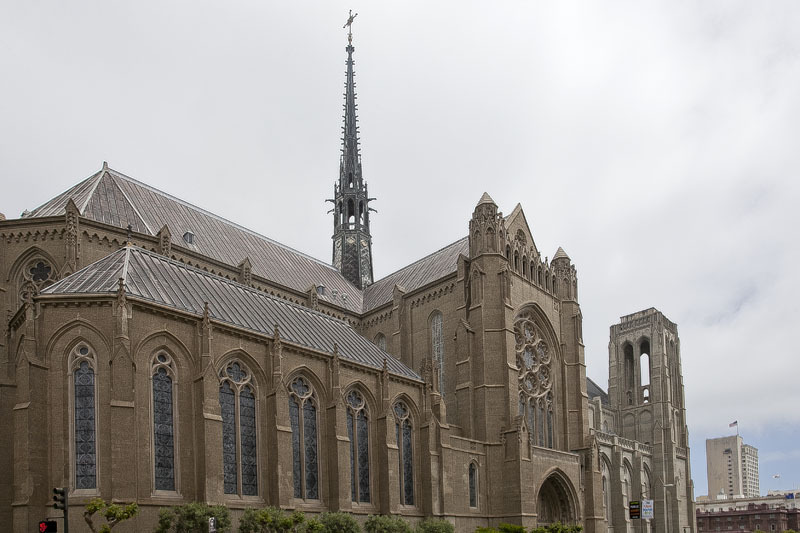 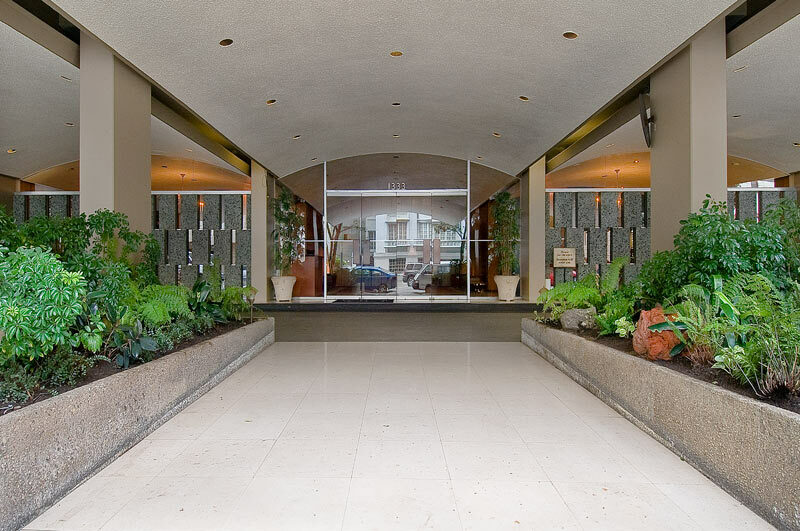 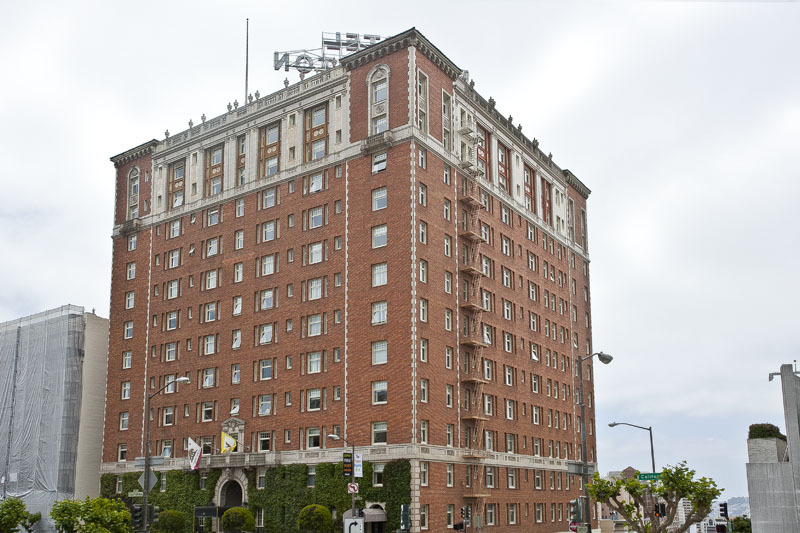 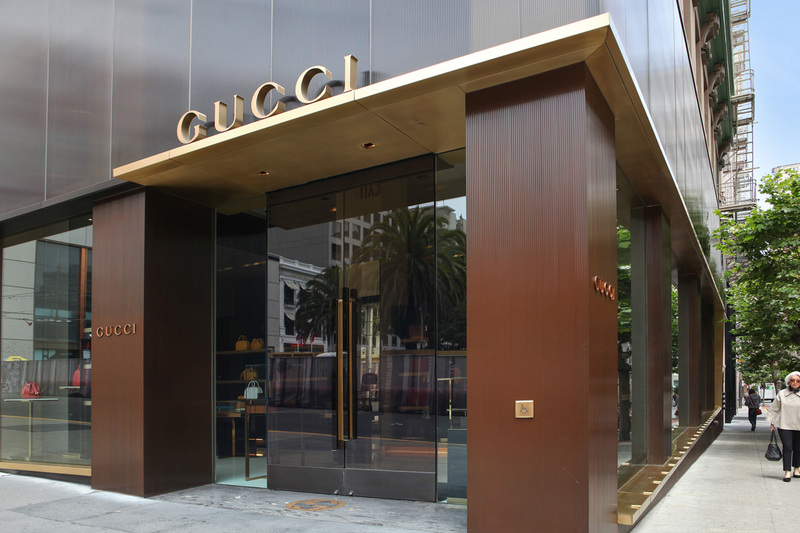 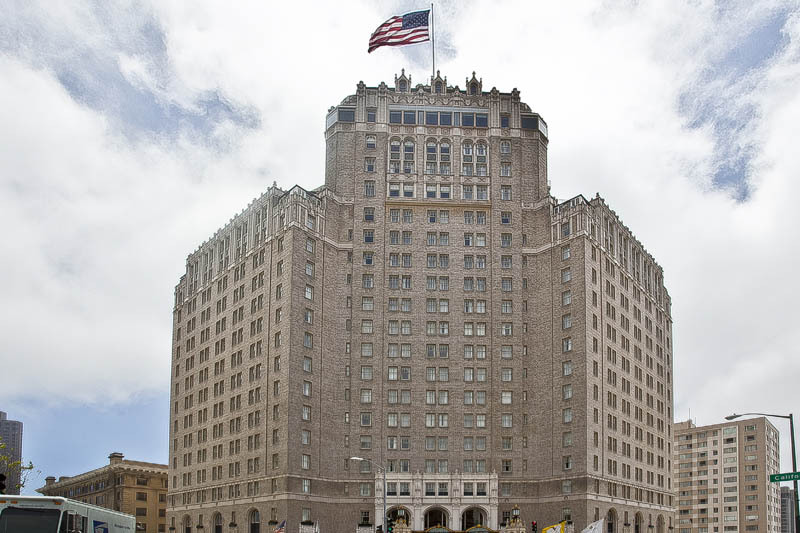 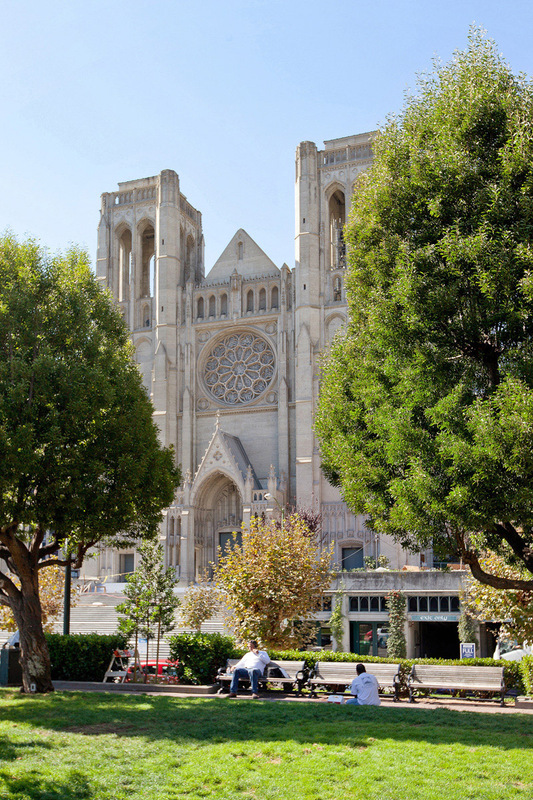 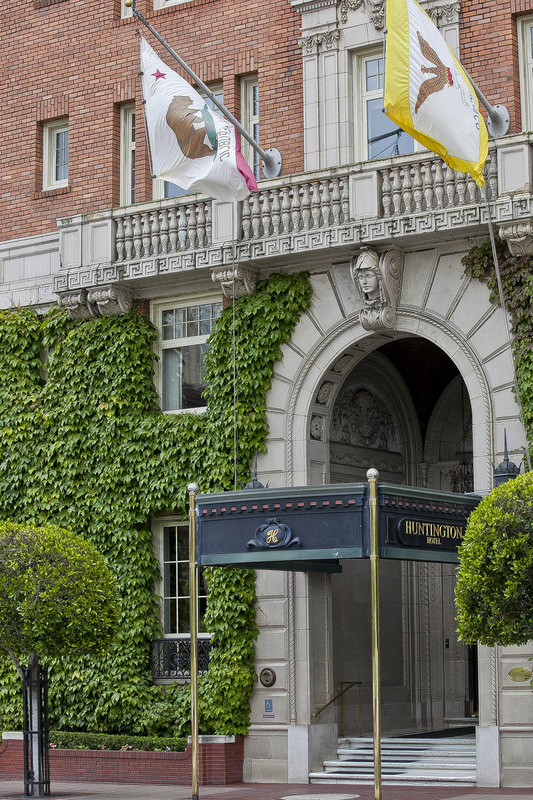 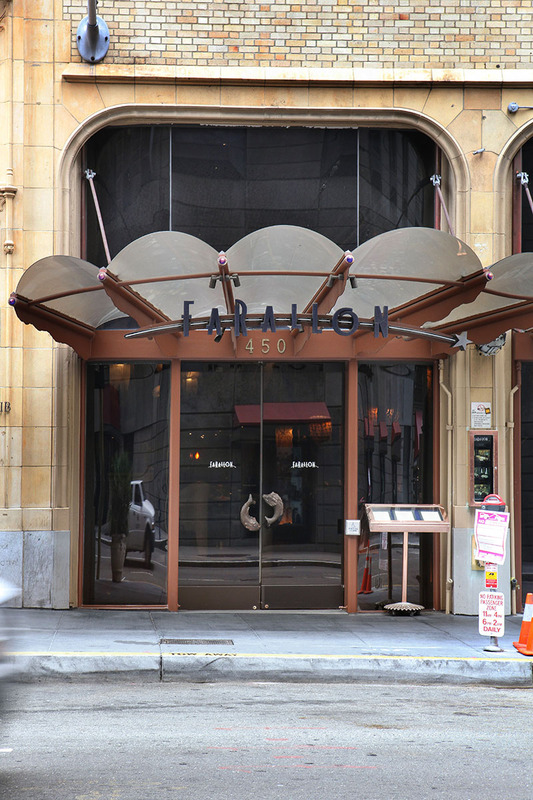 Elegant and glamorous, Nob Hill is home to five legendary hotels, Huntington Park and Grace Cathedral, one of San Francisco’s most iconic structures. 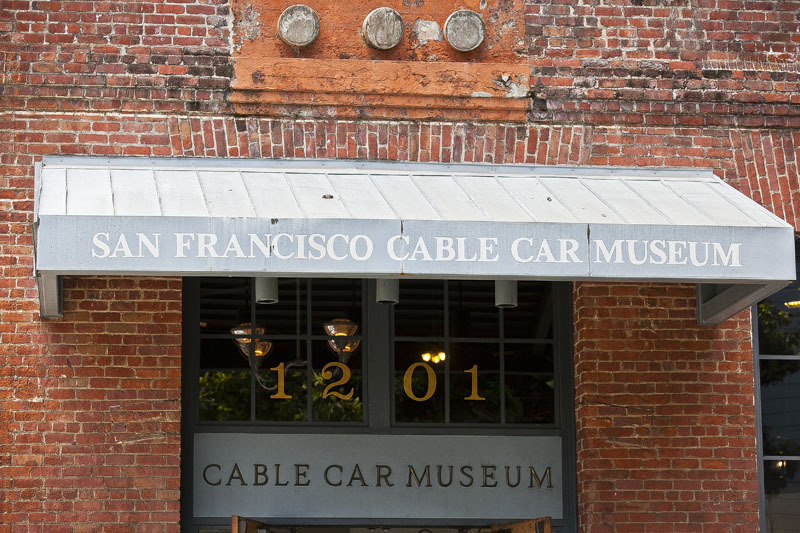 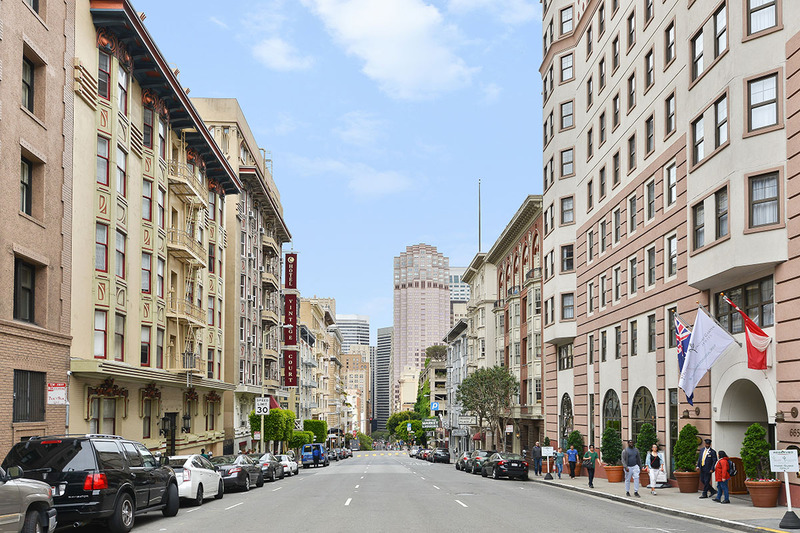 Perched on the commanding heights made accessible in the 1870s by the famous California Street cable car that runs through the heart of the neighborhood, Nob Hill is still home to old San Francisco. 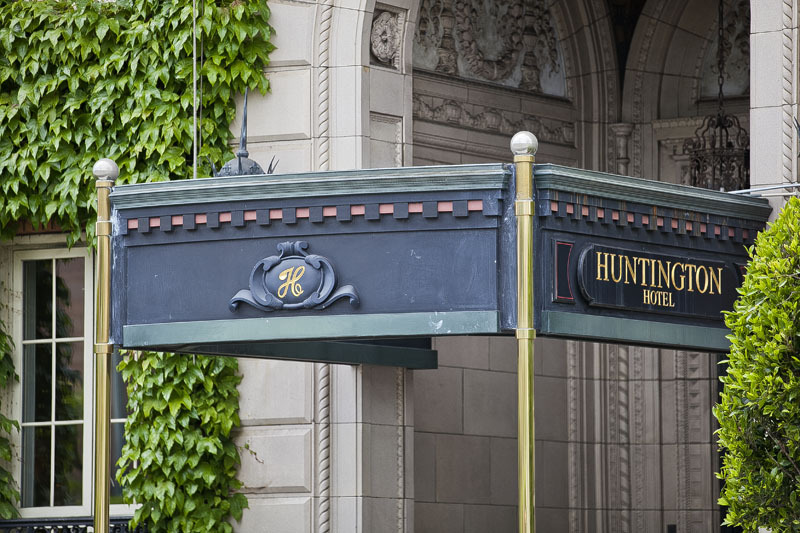 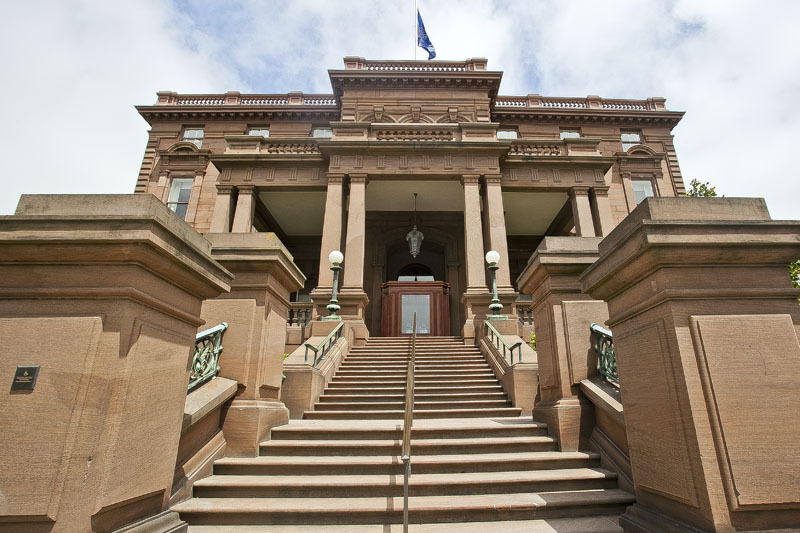 The descendants of the City's founding families still frequent the neighborhood and their clubs are here, specifically the Pacific Union Club and University Club. 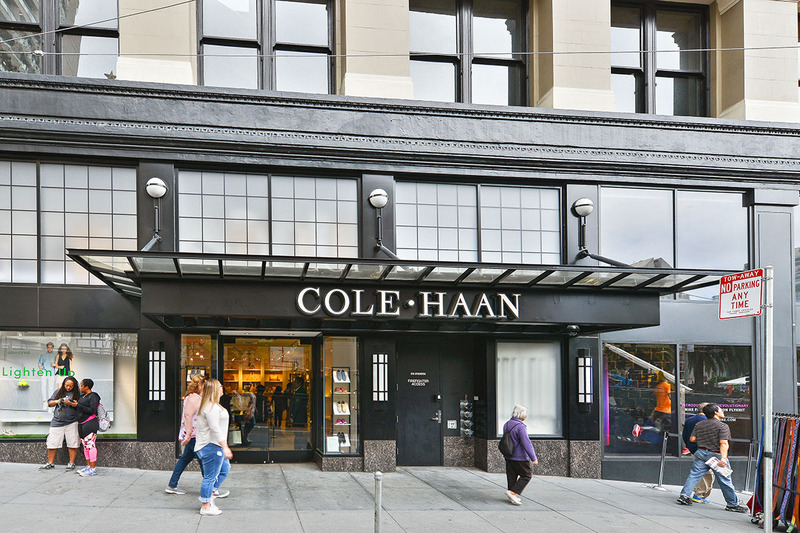 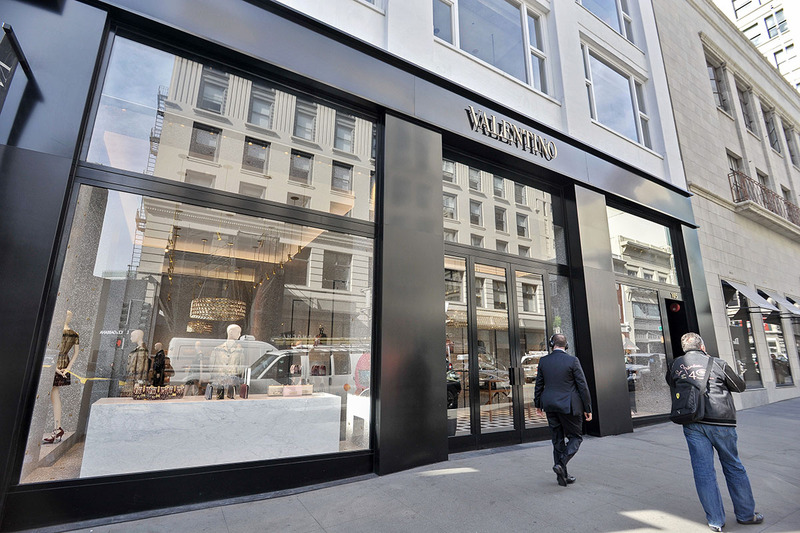 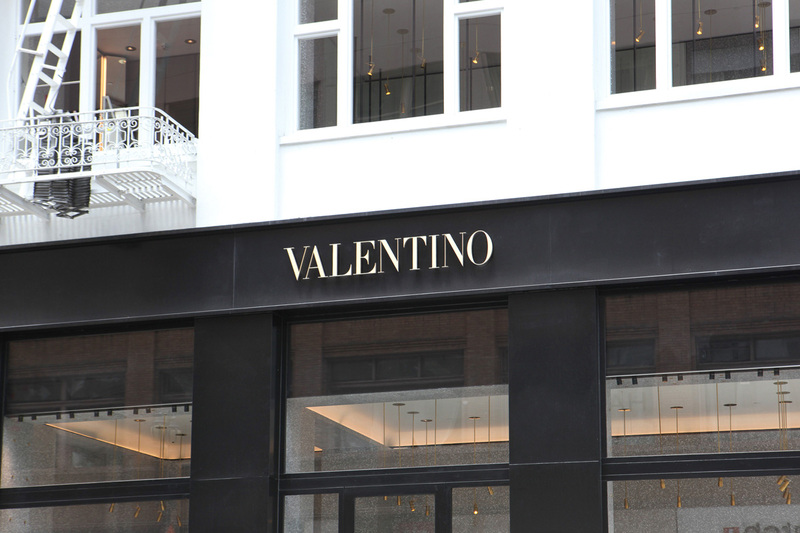 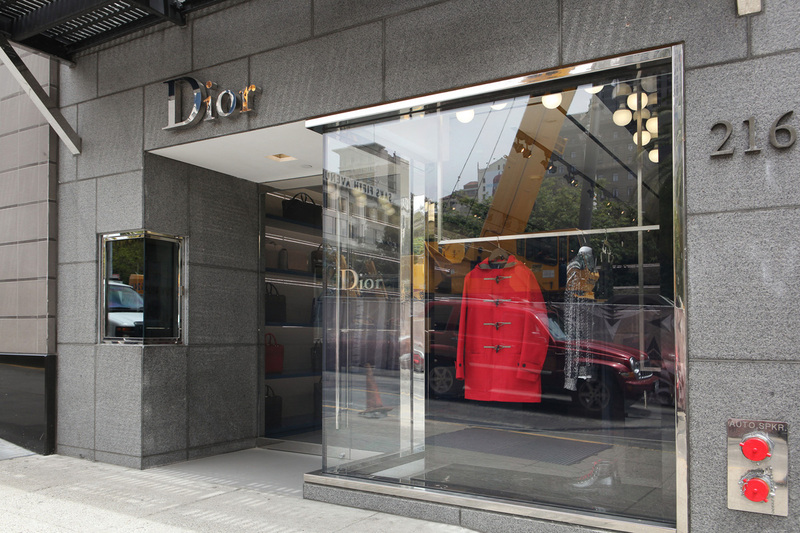 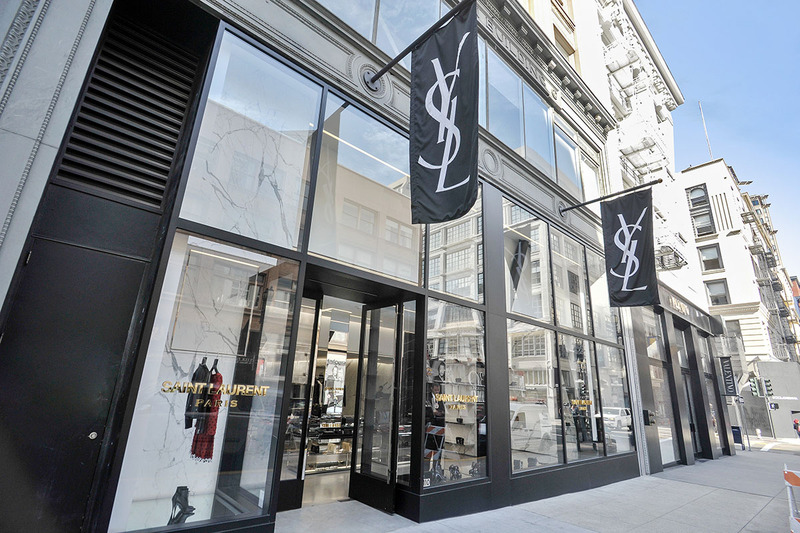 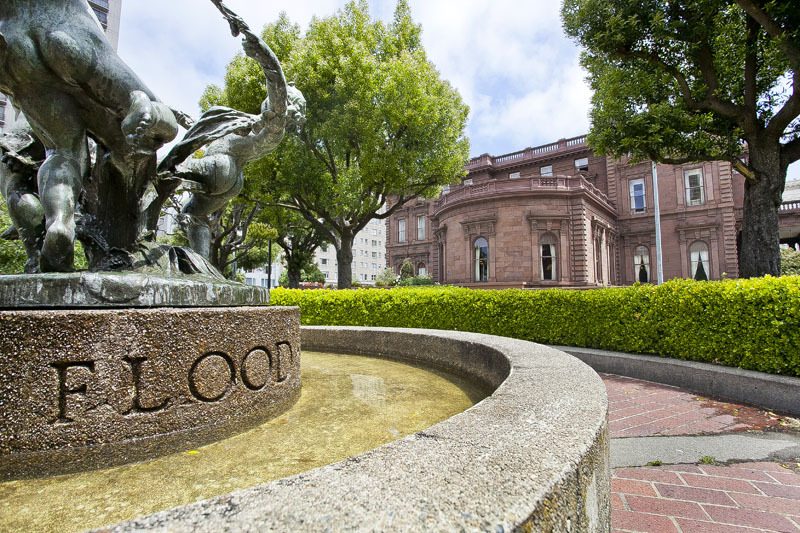 The neighborhood remains the one of most affluent and desirable in all of San Francisco with its historic, yet vibrant character. 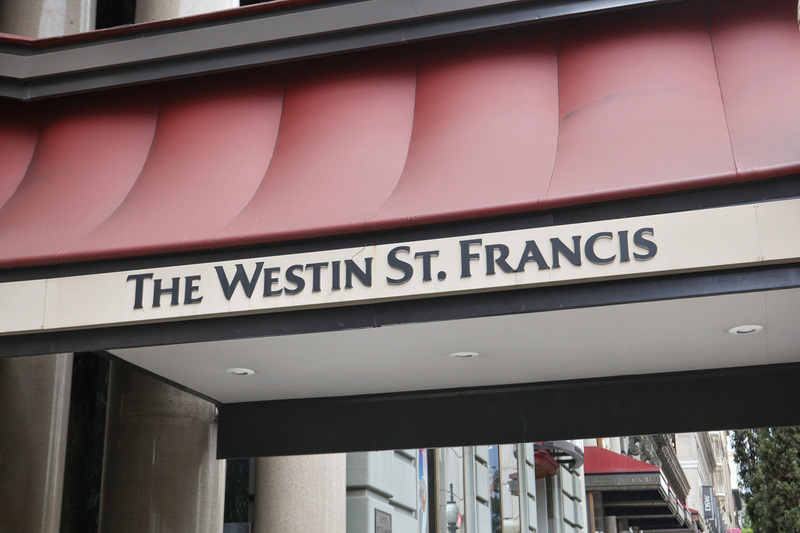 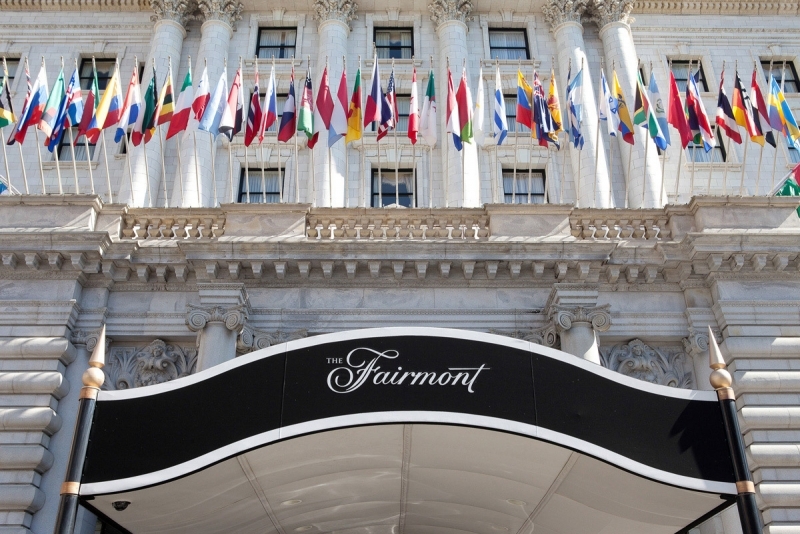 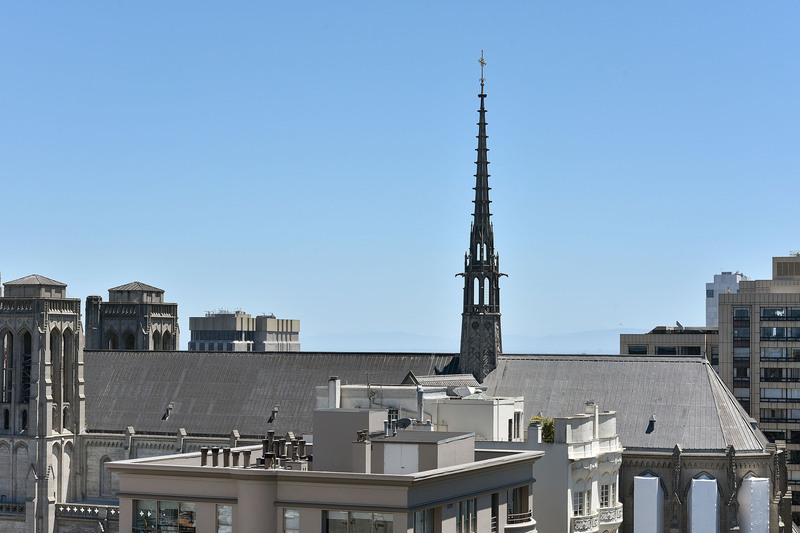 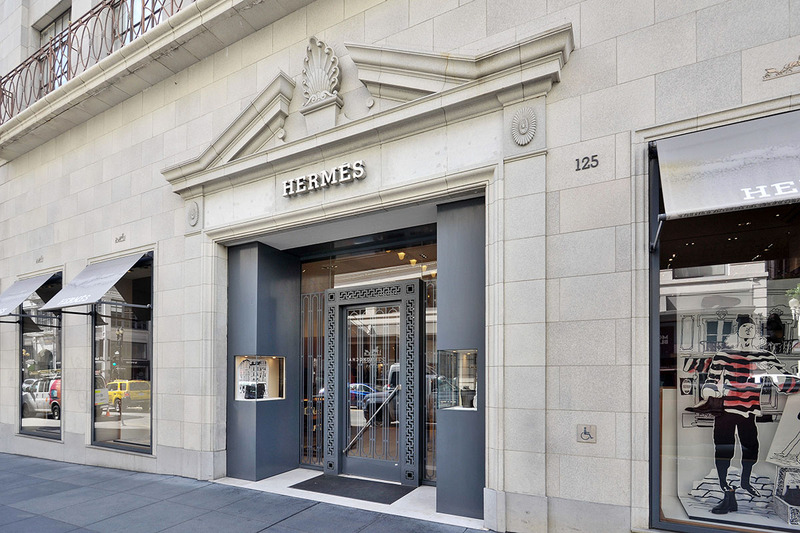 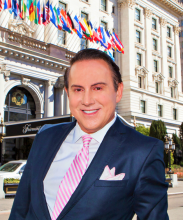 With stunning Beaux Arts-style pre-war luxury buildings decorated with wedding-cake facades, the magnificent palace-like Fairmont Hotel and the iconic Grace Cathedral, Nob Hill is truly San Francisco’s own version of Paris. 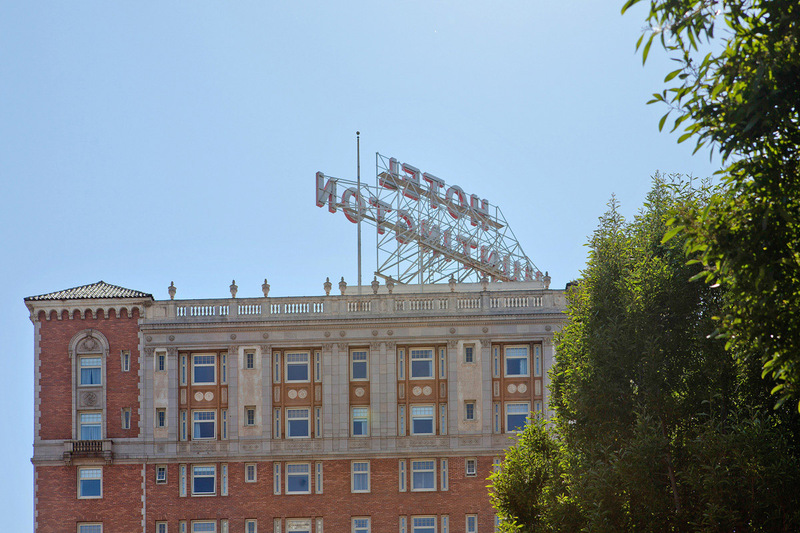 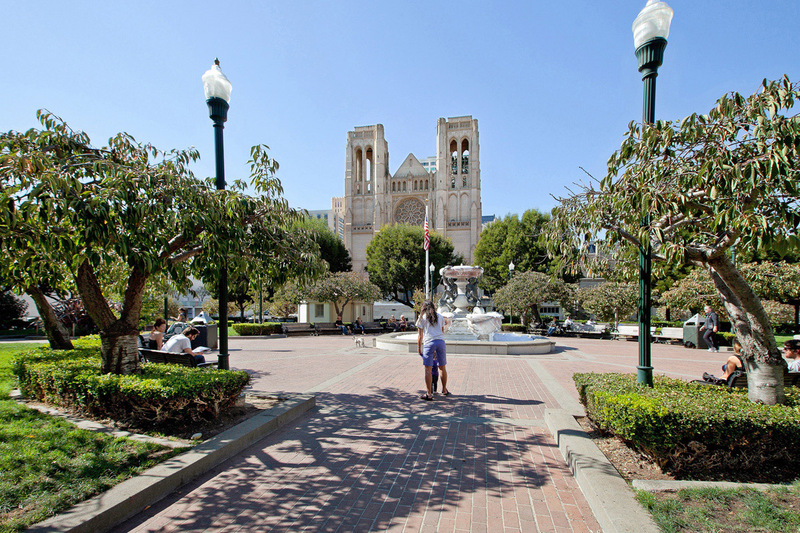 It is also the backdrop of many famous movie and television scenes over the decades. 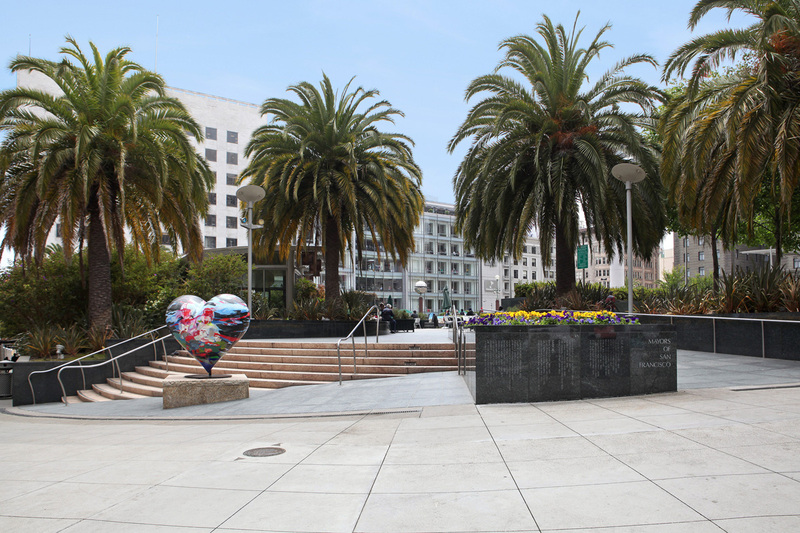 At the heart of Nob Hill is Huntington Park, and its 10-foot tall Fountain of Tortoises. 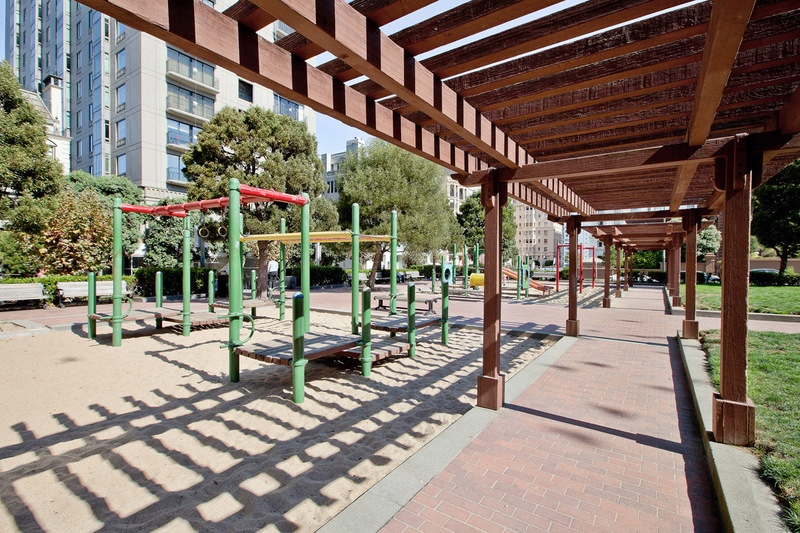 Shady benches around the classic urban square provide a welcome rest for those who hike up the hill, and a children’s playground is a hidden gem. 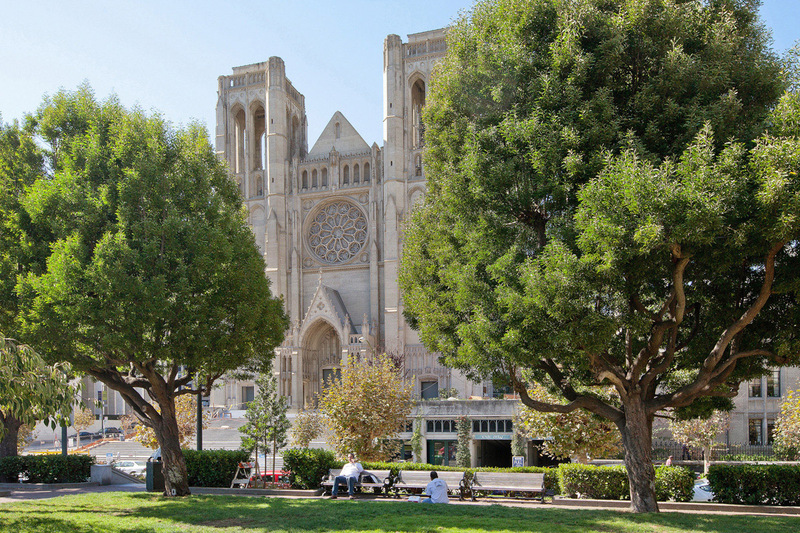 Acclaimed world-class restaurants and charming cafes dot the neighborhood. 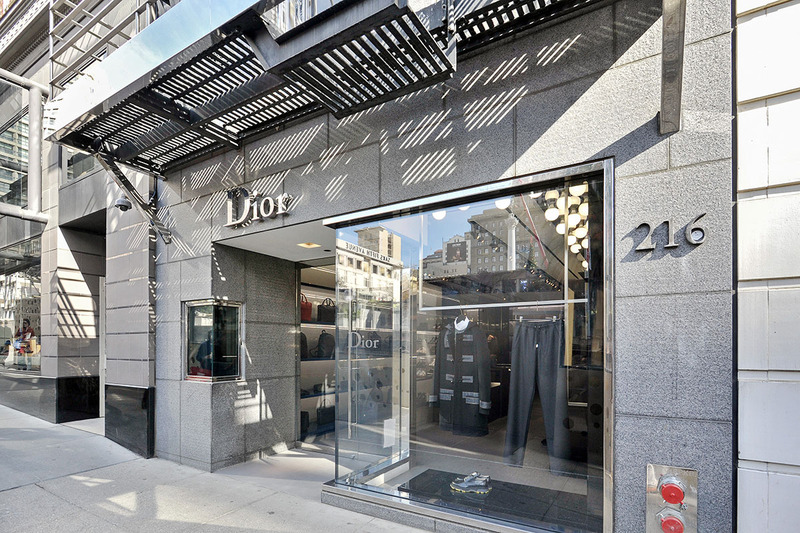 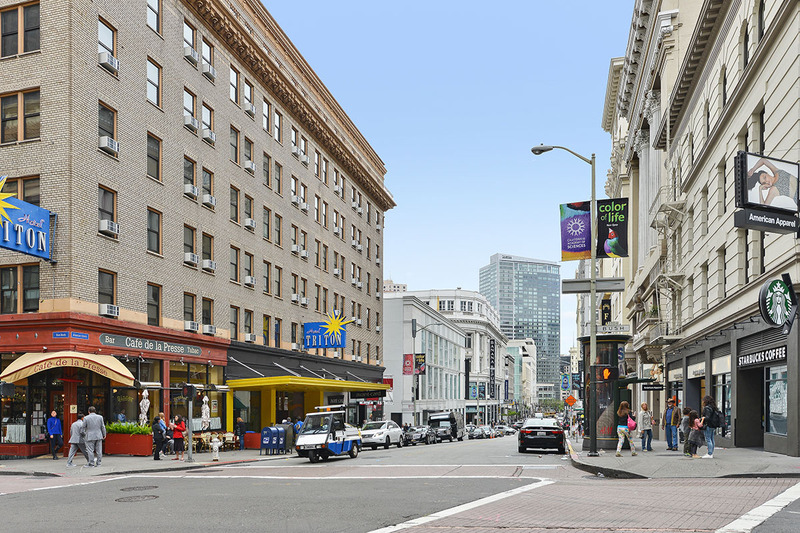 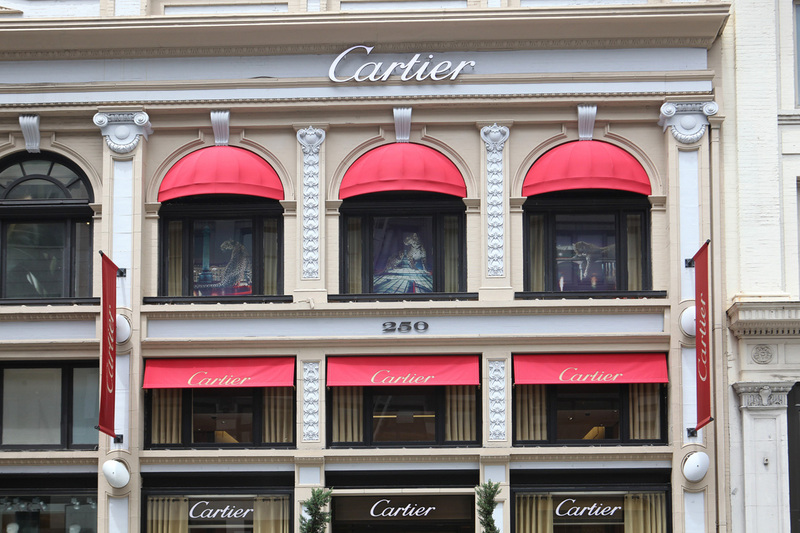 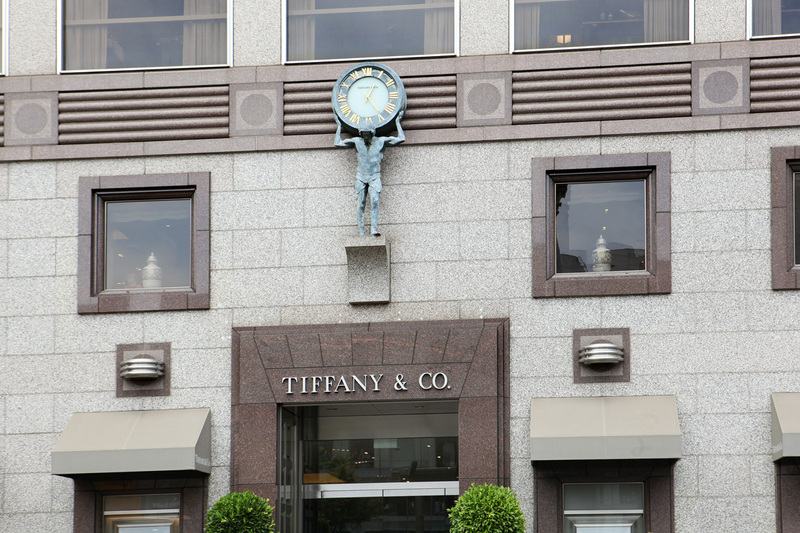 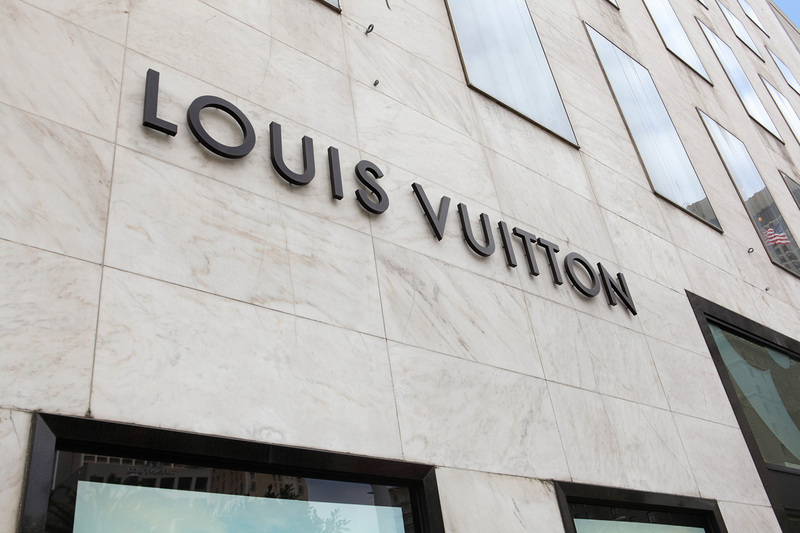 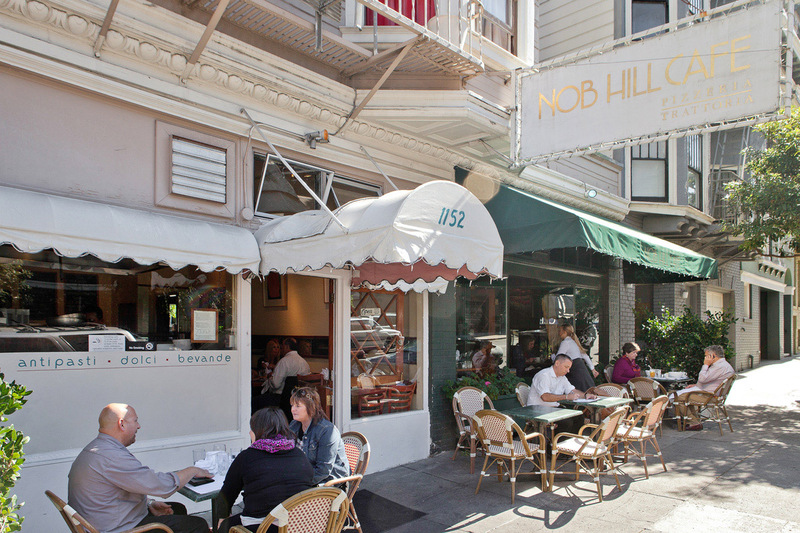 Nob Hill is situated in the heart of the City, in the midst of world-renowned hotels, boutiques, theaters, and restaurants. 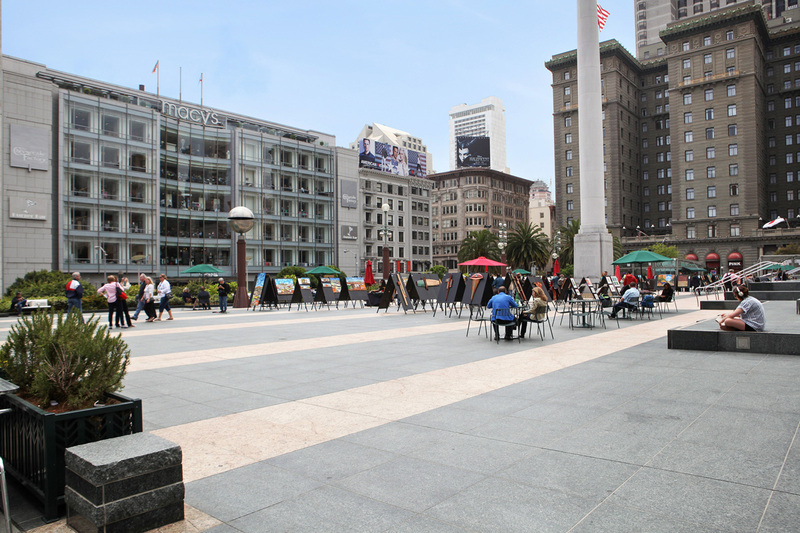 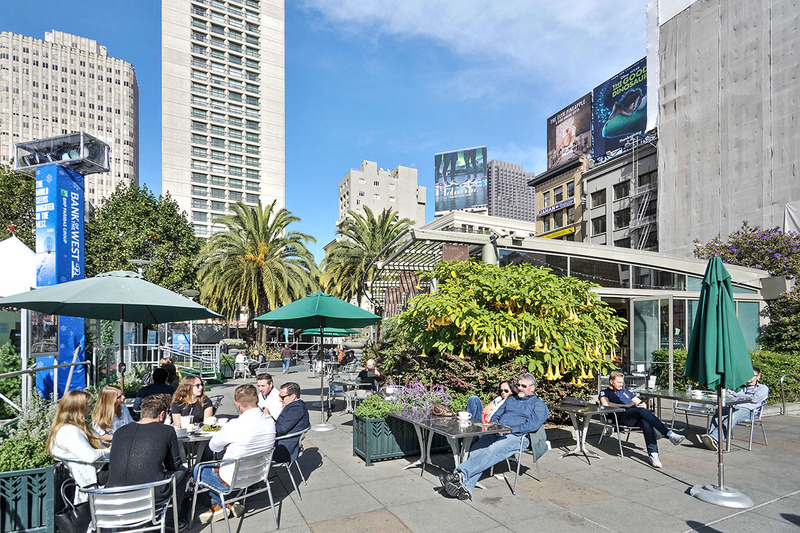 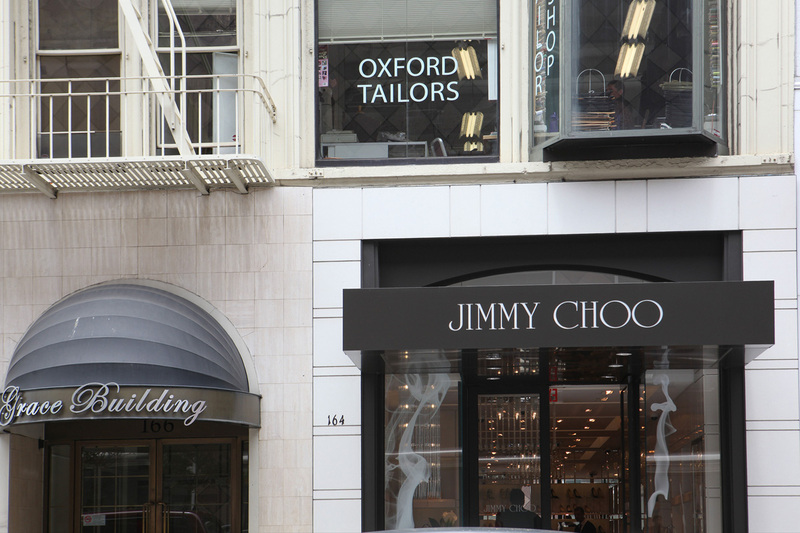 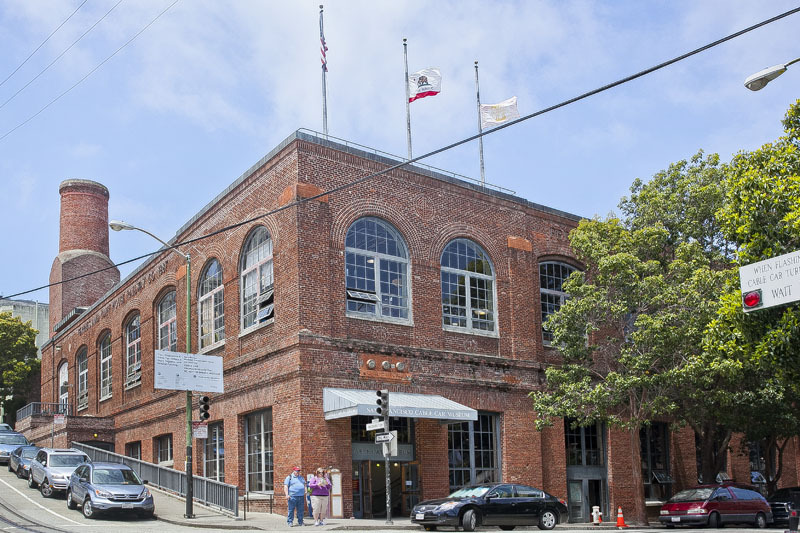 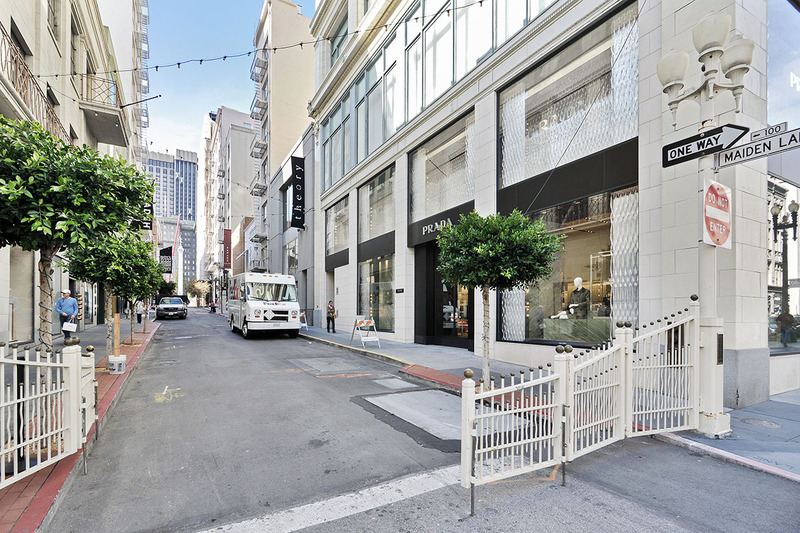 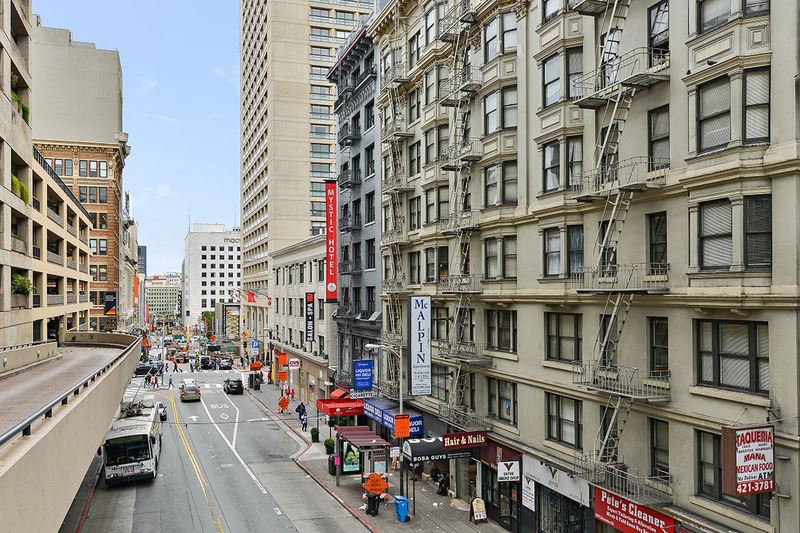 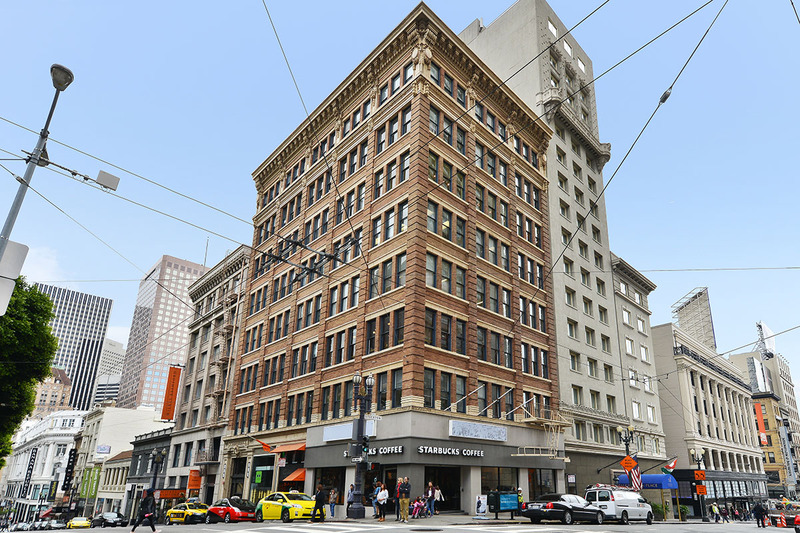 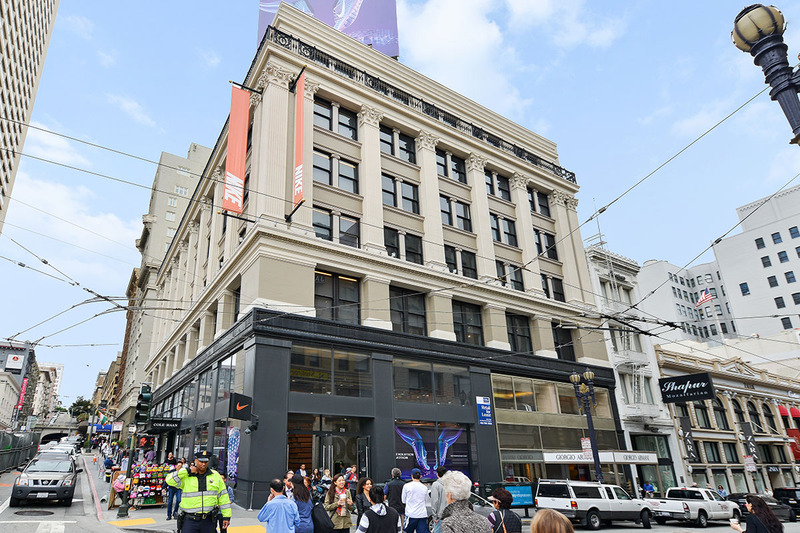 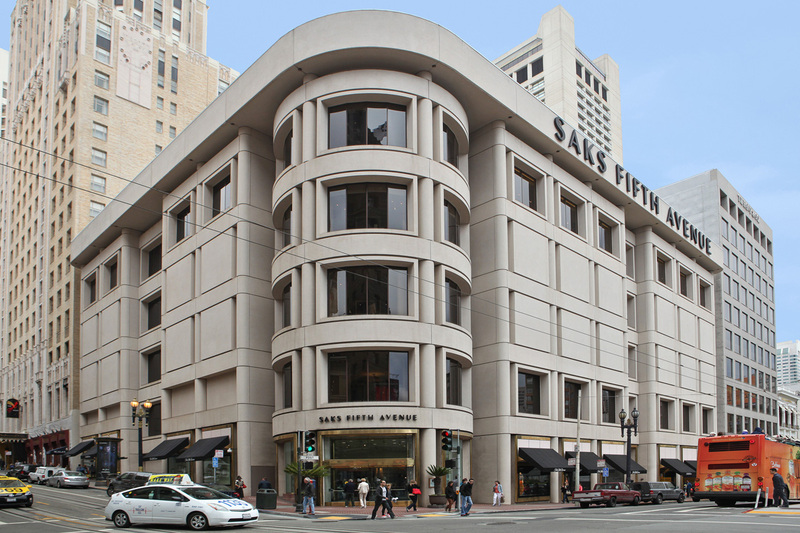 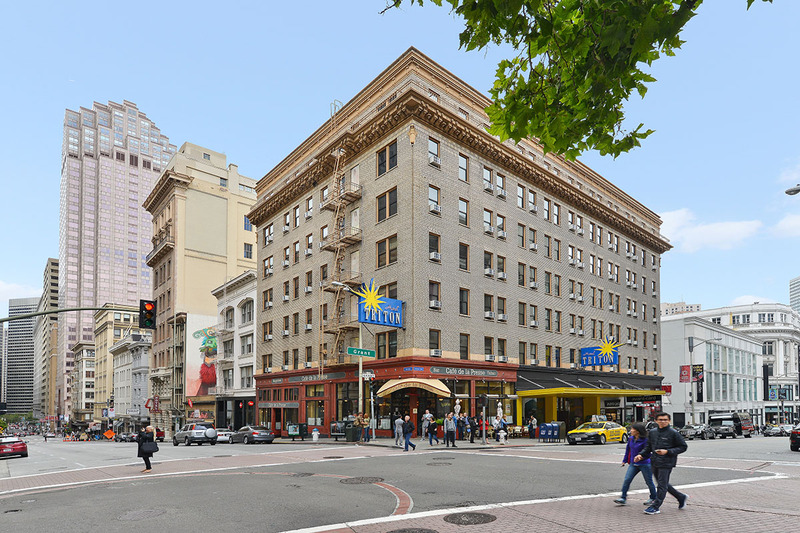 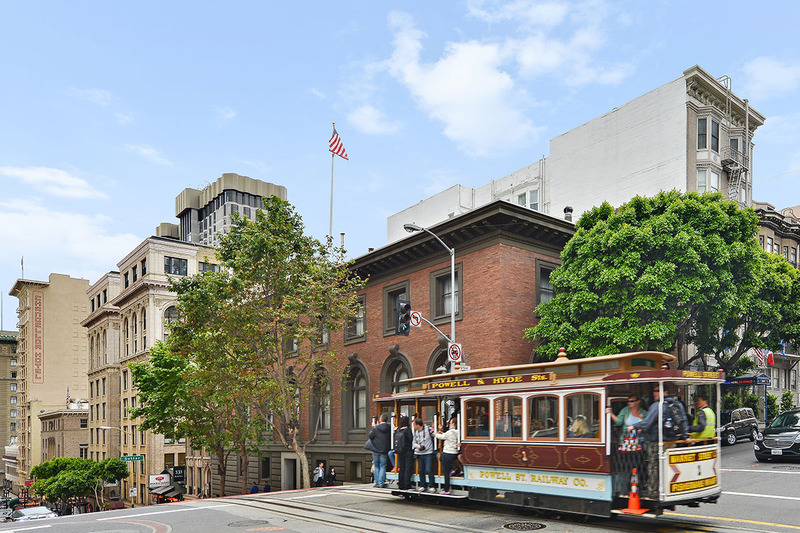 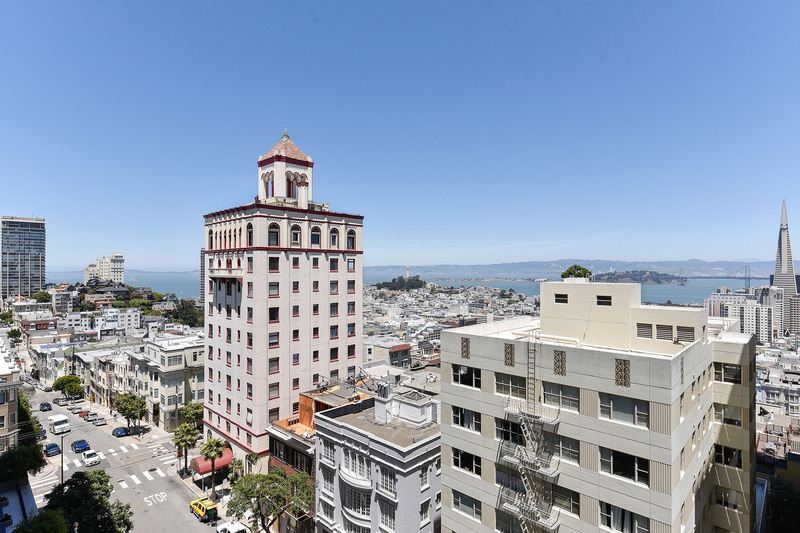 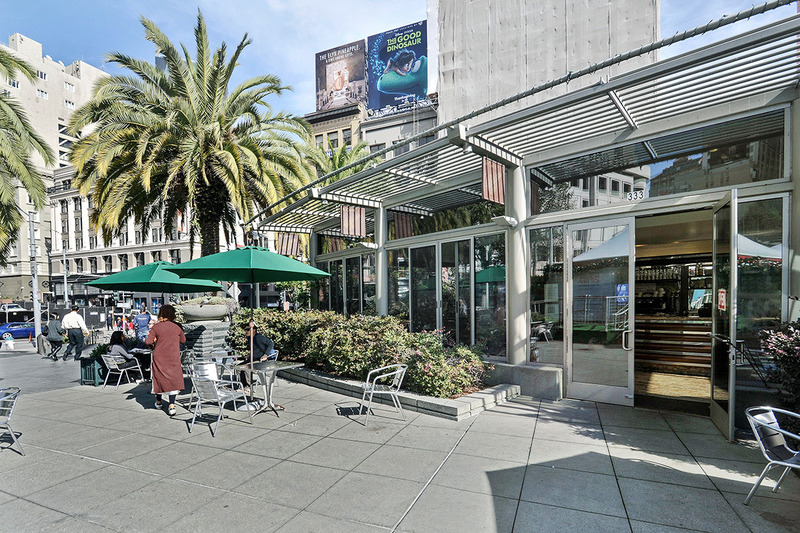 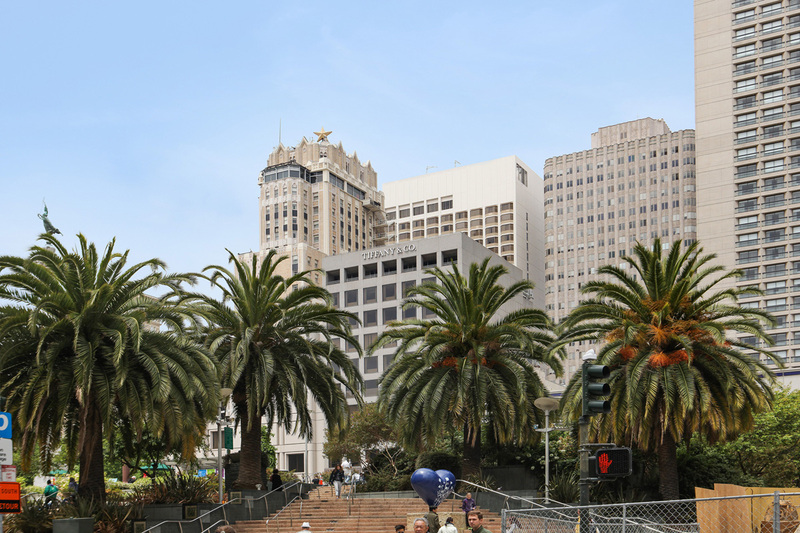 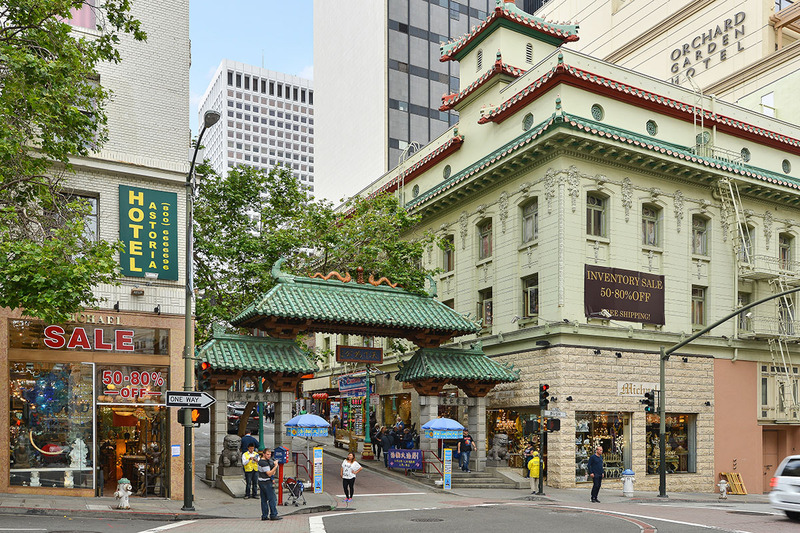 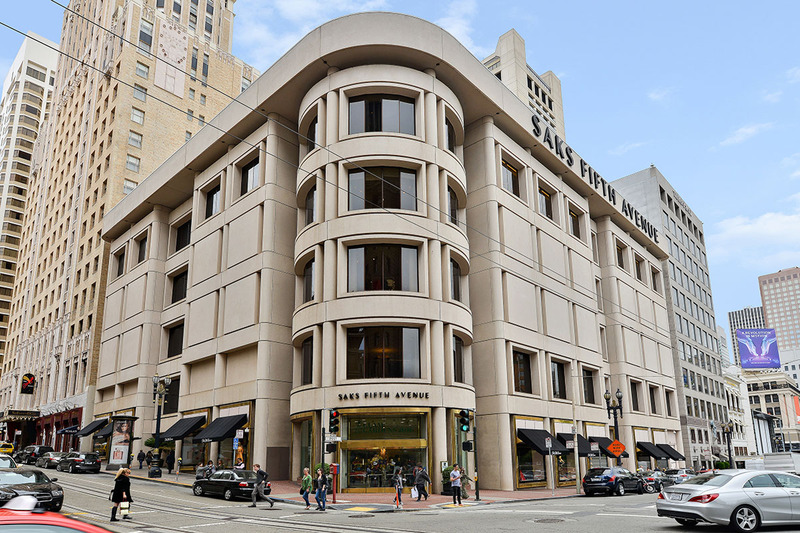 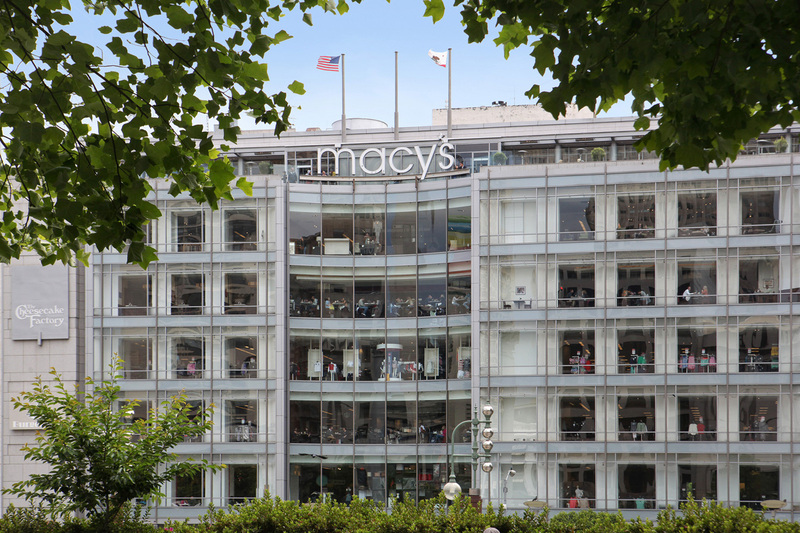 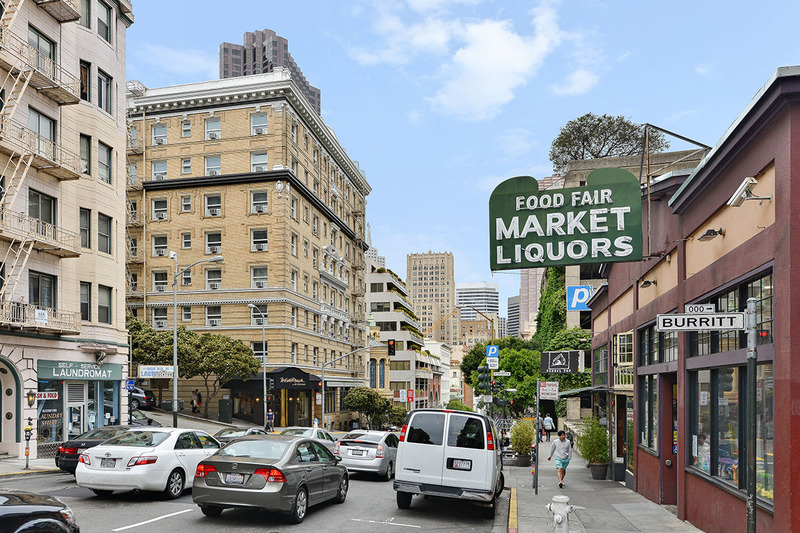 Surrounded by Chinatown, North Beach, Union Square, the Theater District, the Financial District and SOMA’s booming technology center. 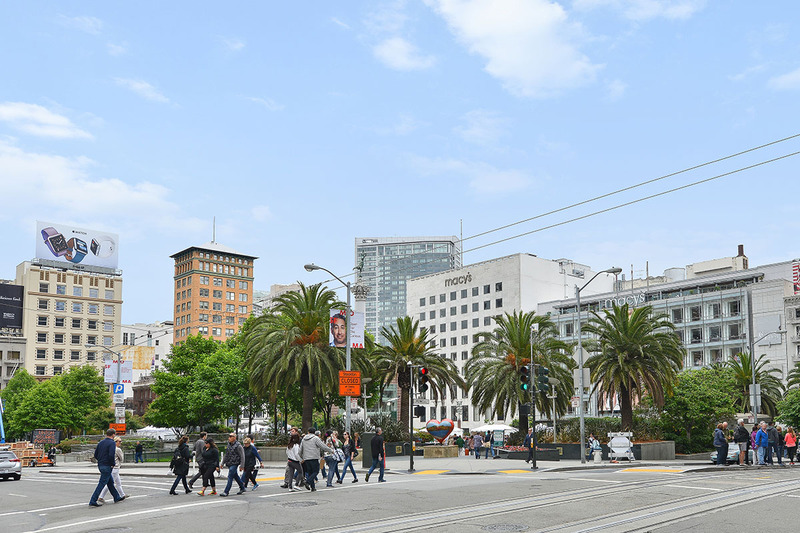 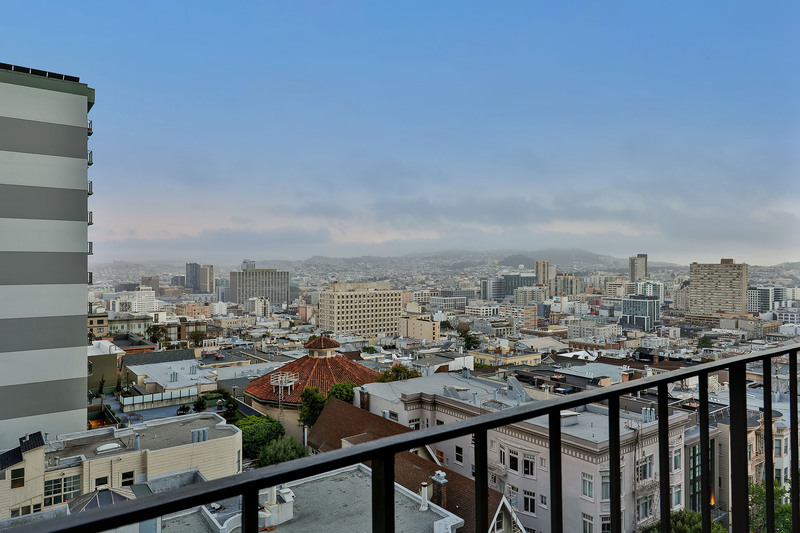 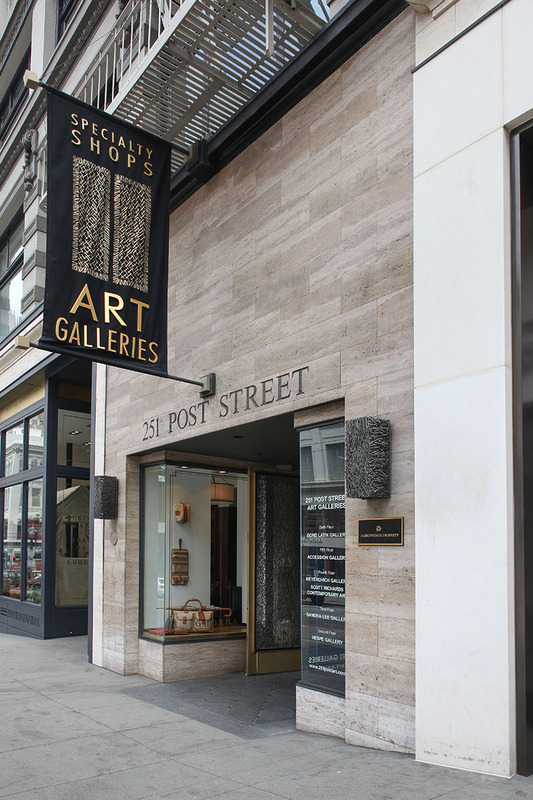 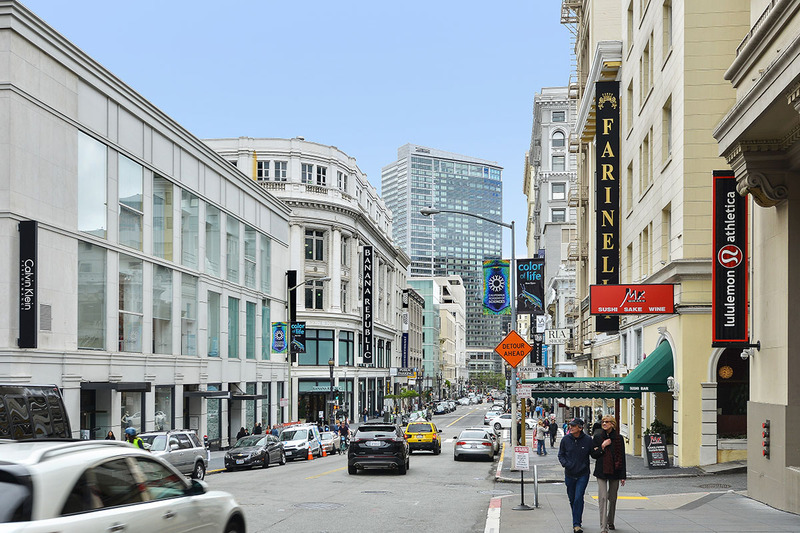 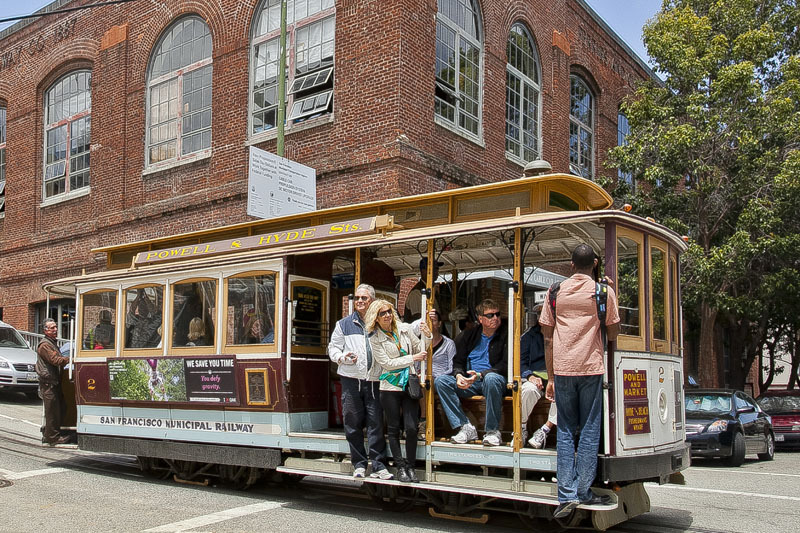 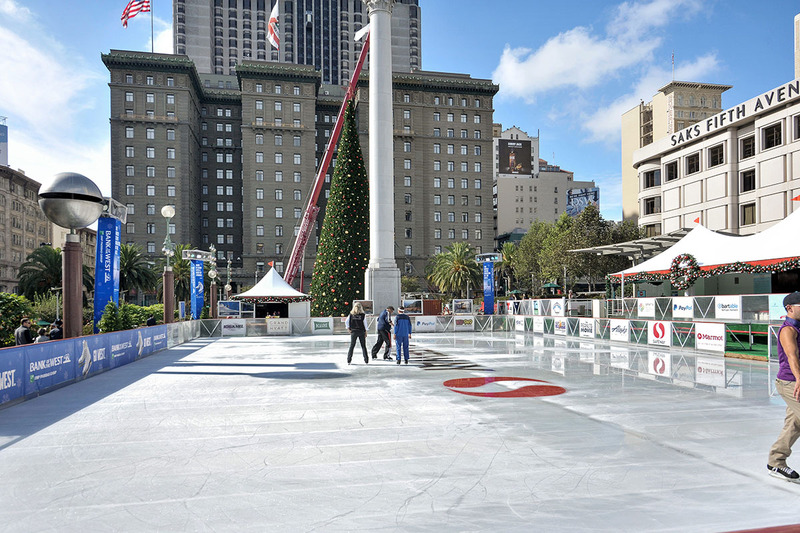 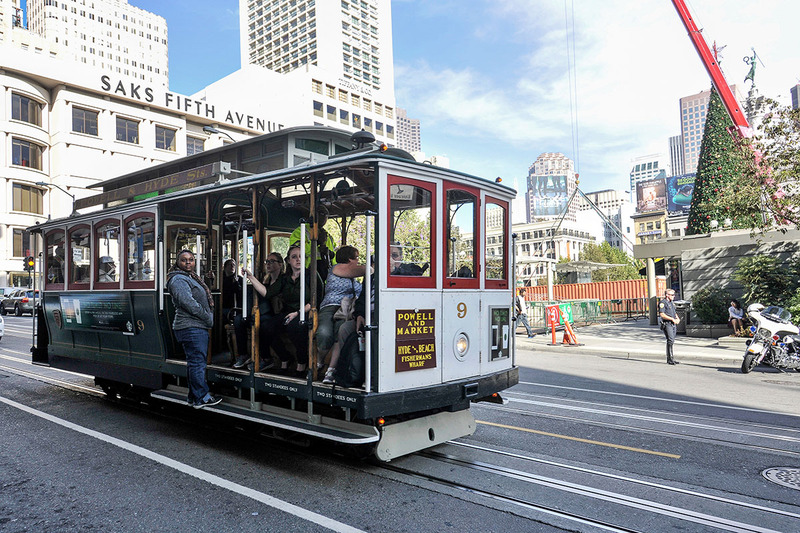 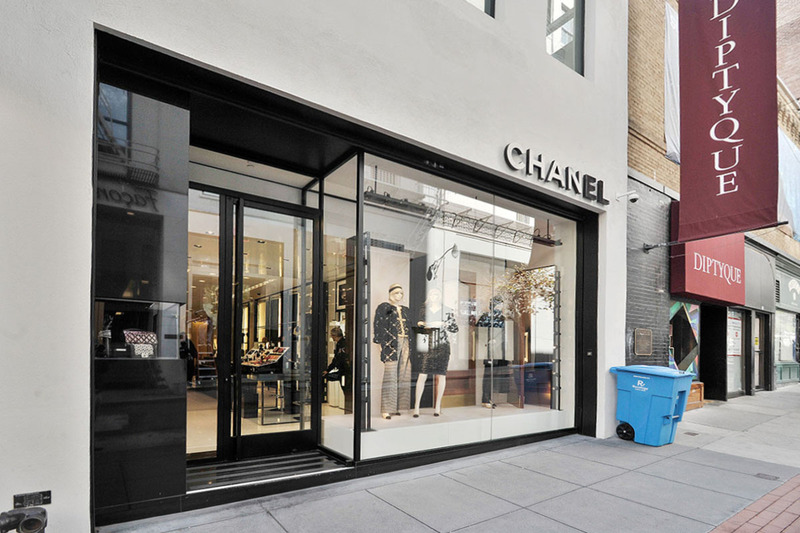 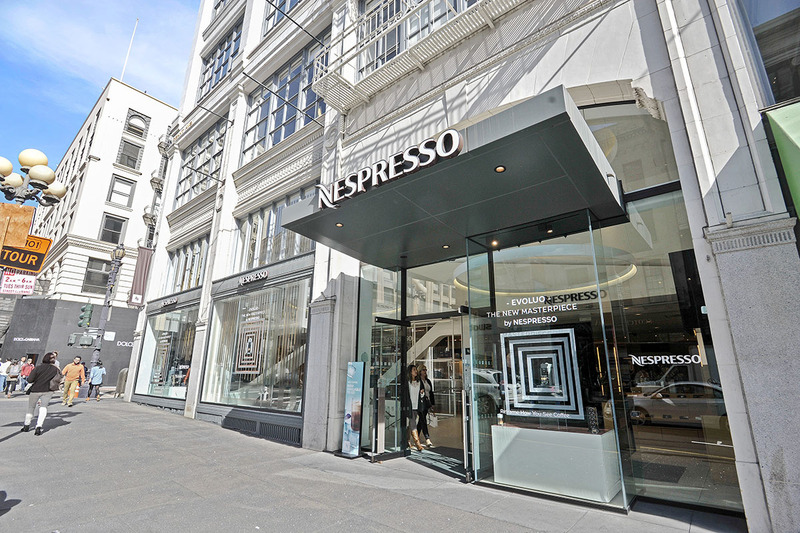 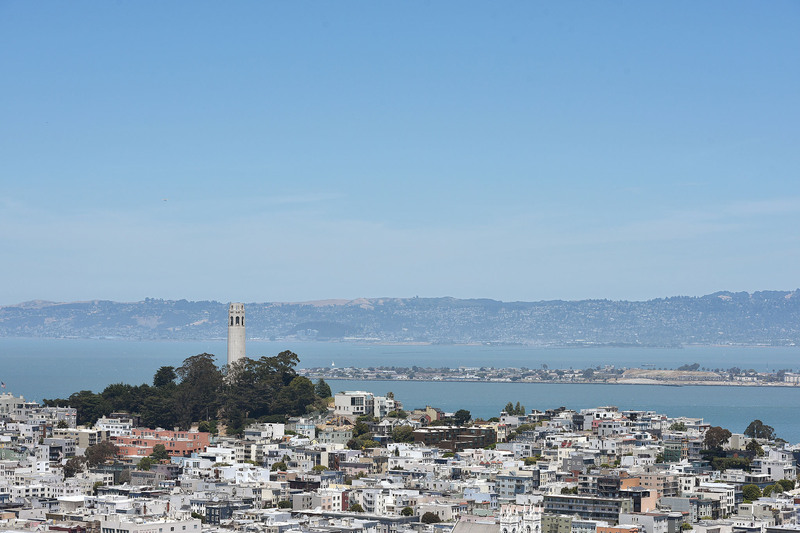 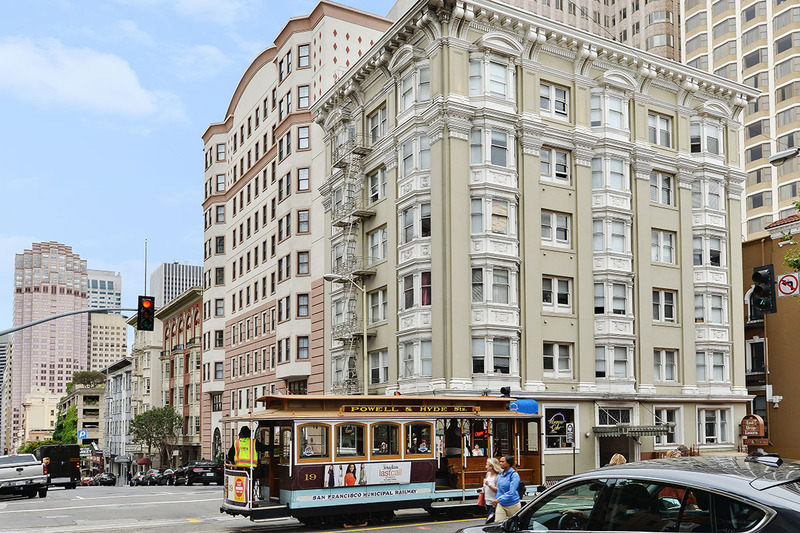 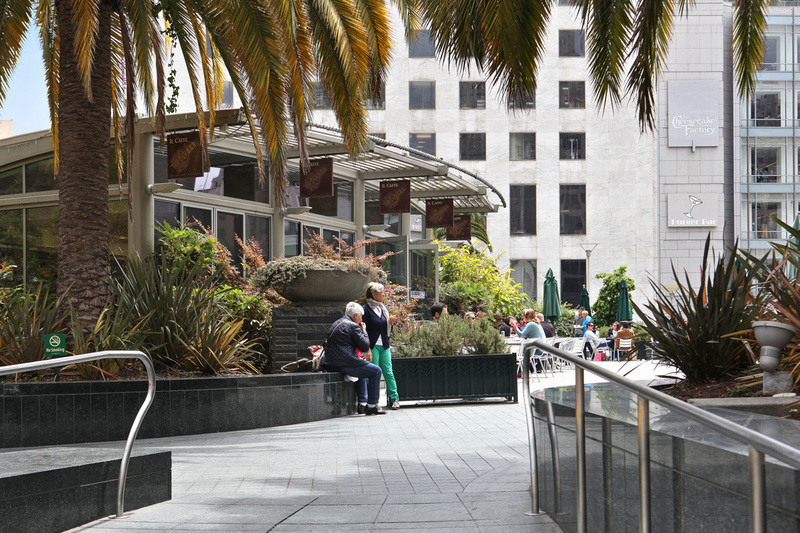 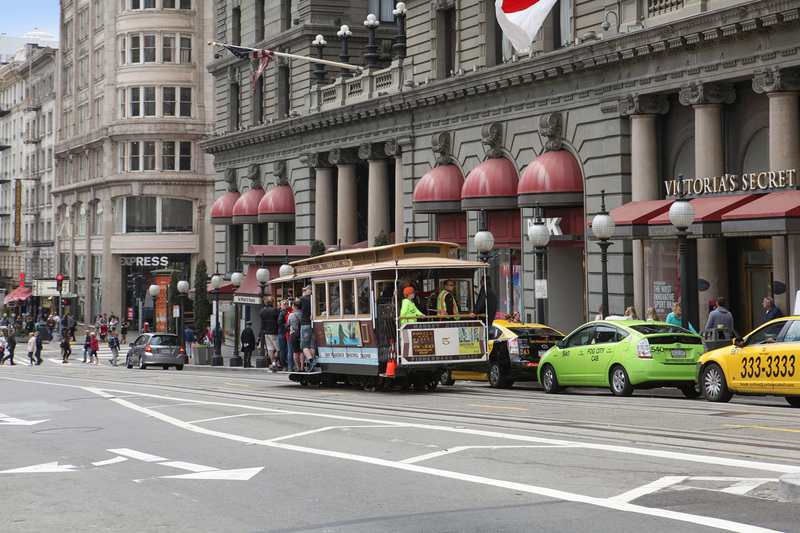 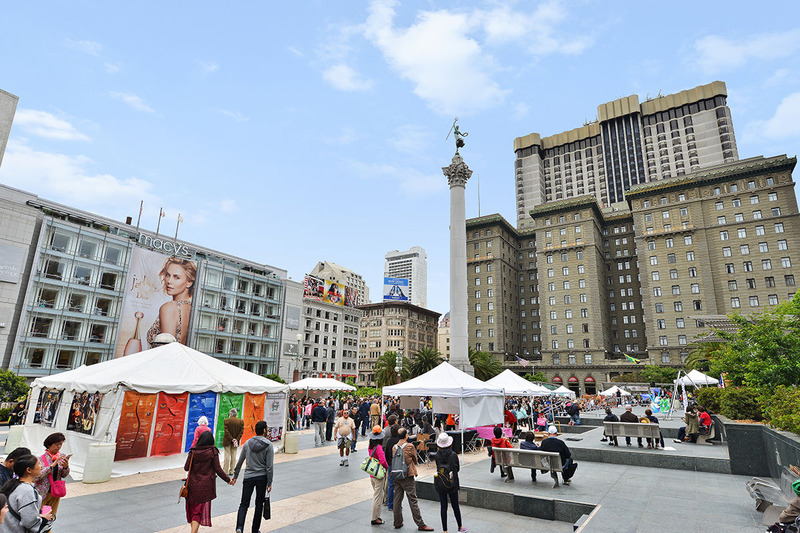 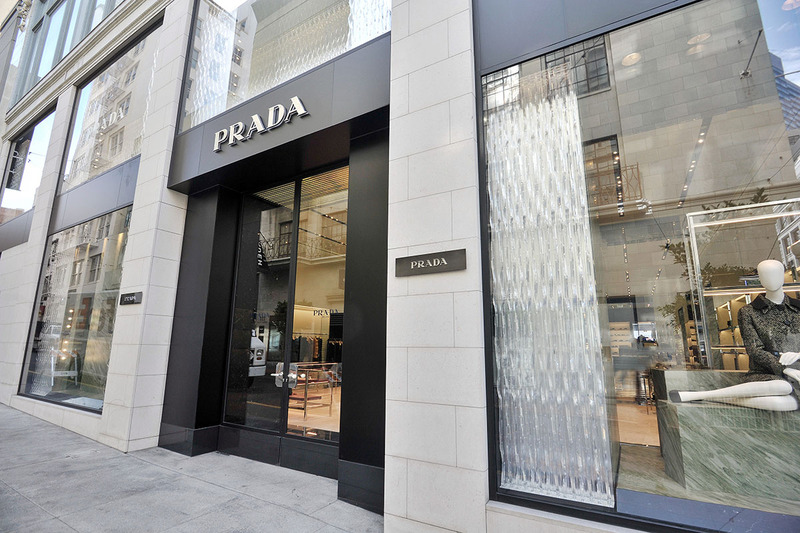 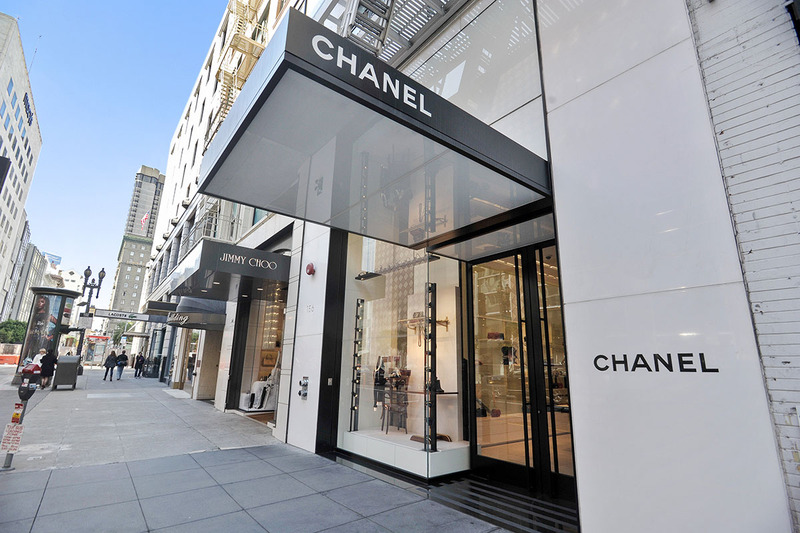 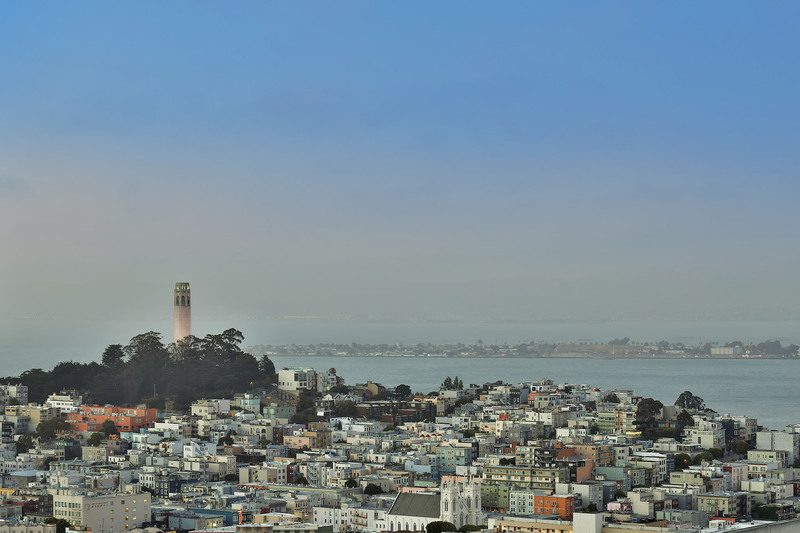 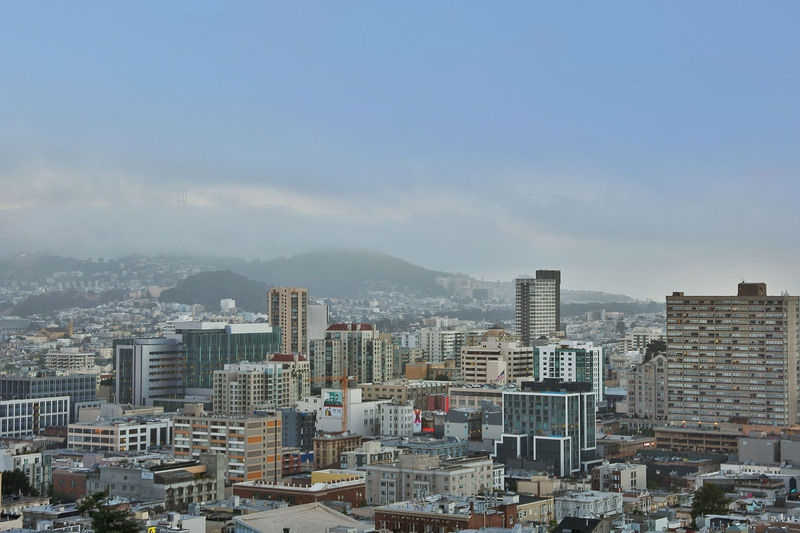 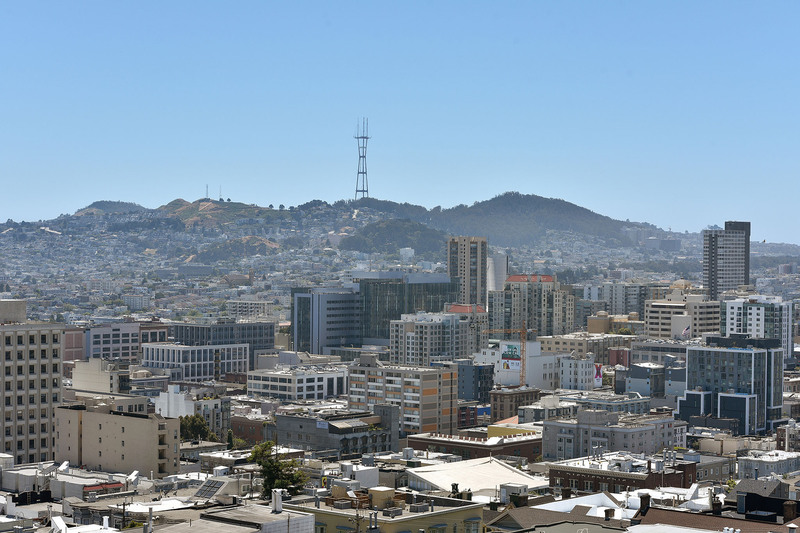 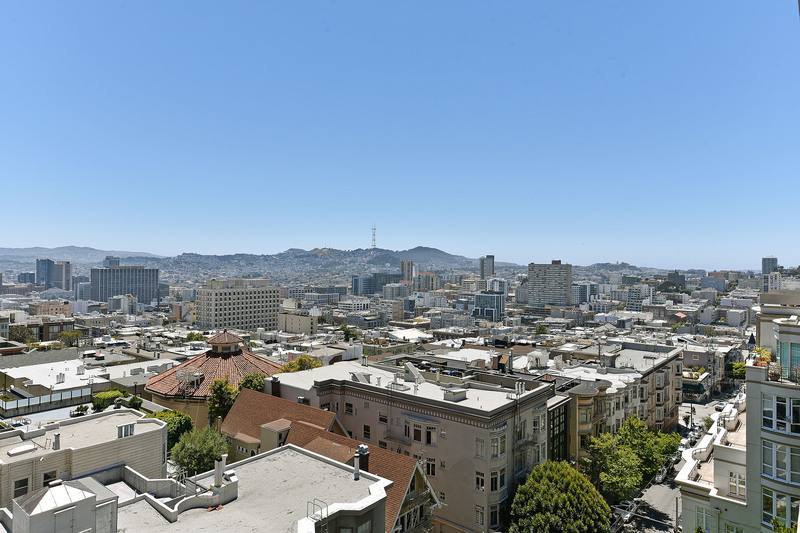 Nob Hill residents can enjoy a sophisticated, yet comfortable urban lifestyle as well as access to San Francisco’s world-class cultural, dining, business, and entertainment .destinations. 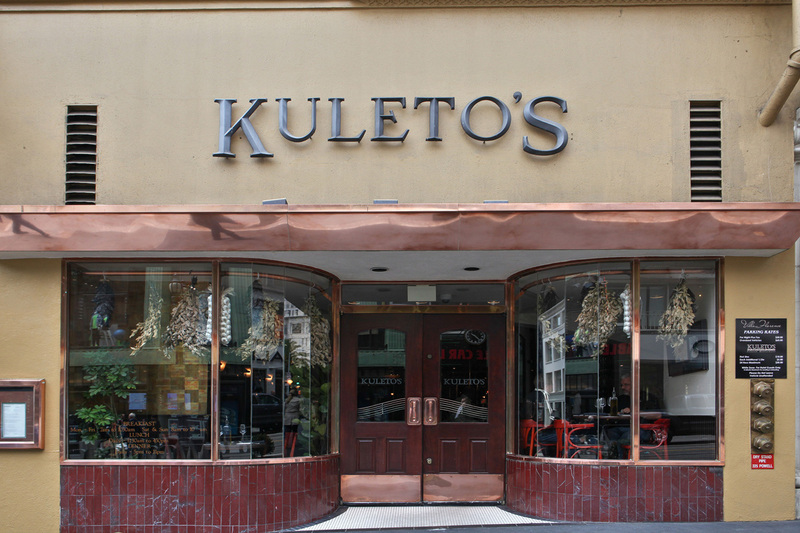 Tuesday, December 11, 2018, from 9:30 am until 11:00 a.m.